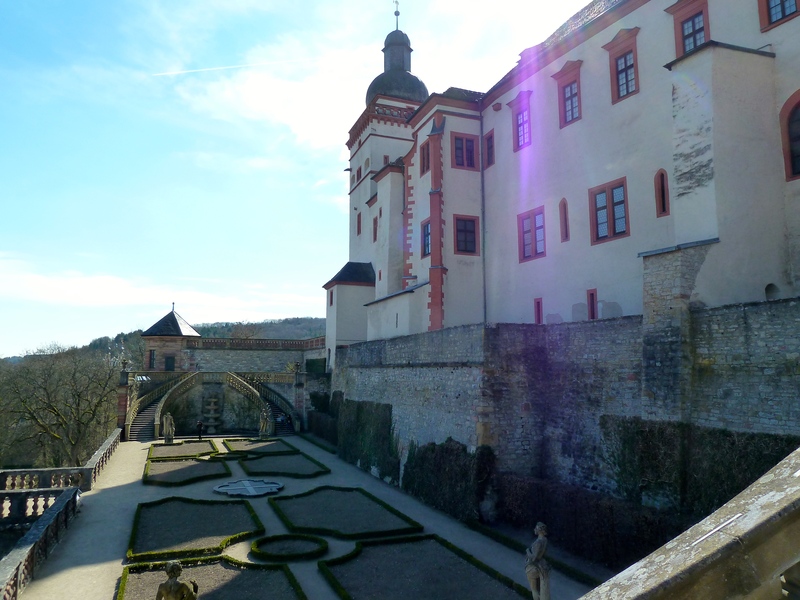 On my Great Easter Break Adventure I planned only a brief, day and a half stop in the town of Würzburg. I had come for one reason and one reason only: to see the Residence, a UNESCO World Heritage Site. Pictures on Pinterest were so stunning; I just knew I couldn’t miss it. And I’m not above admitting that Pinterest inspired this part of my journey. 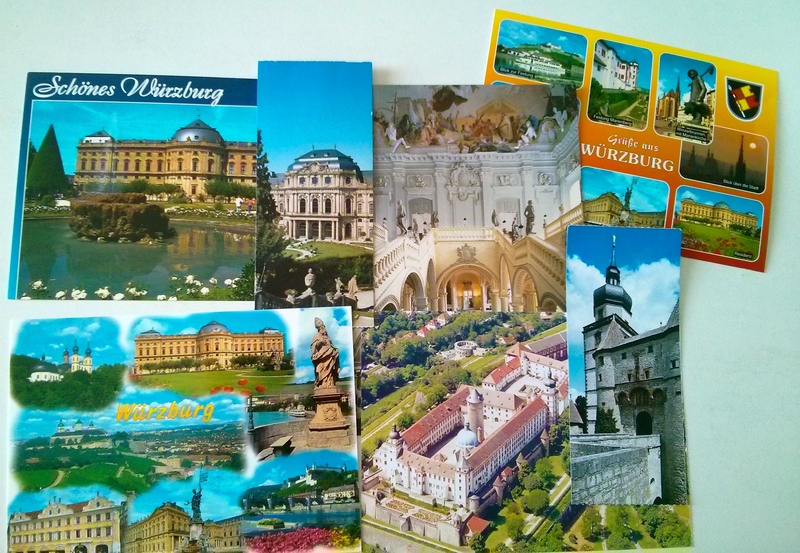 It turns out, Würzburg was a lovely town, with much more than just the magnificent Residence to offer. I’m so glad I decided to visit. Spring weather had finally come to Bavaria for my stay in Würzburg, so I spent my first afternoon wandering around town. It isn’t a very large place, so I covered most of the historic landmarks in the city. 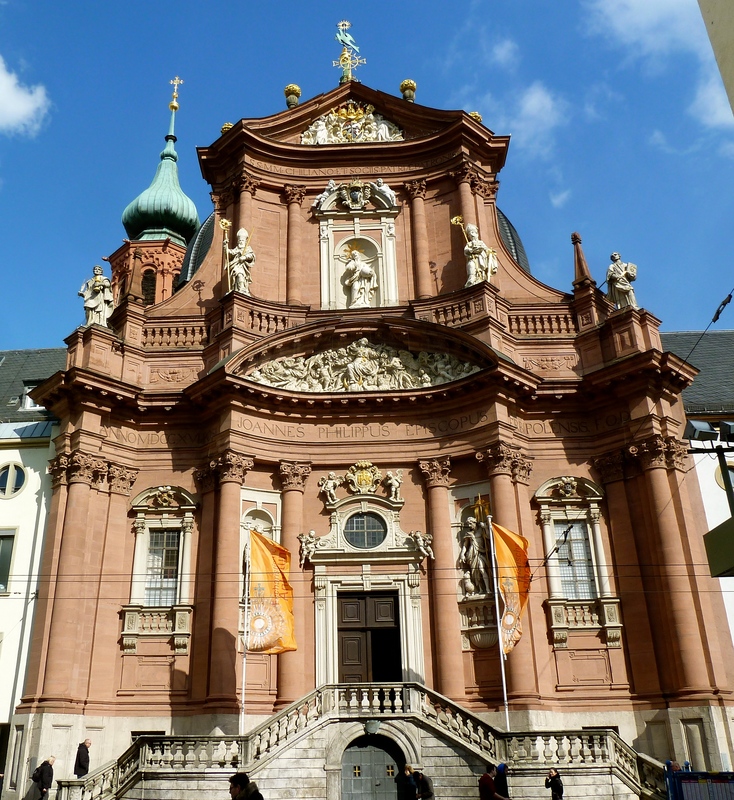 I saw the Juliusspital, a Baroque pharmacy built by Prince Bishop Julius Echter. 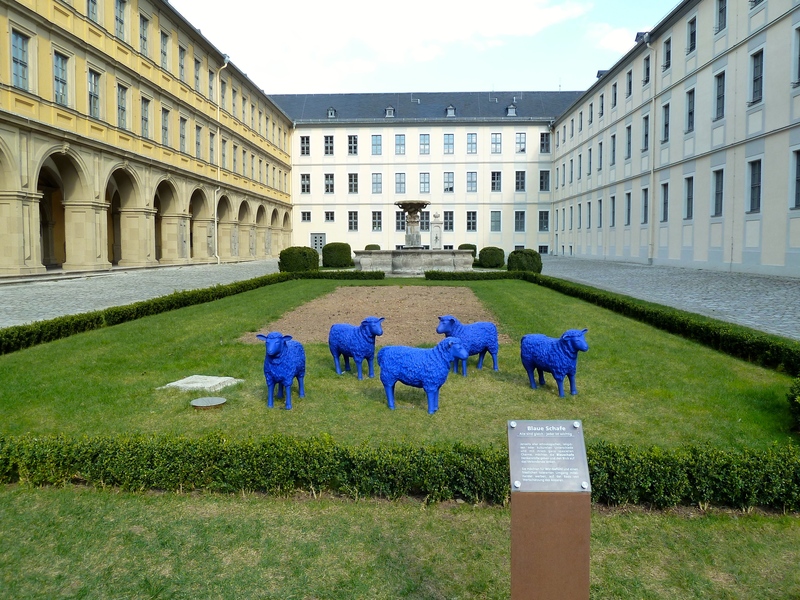 It has a courtyard and garden, with statues of blue sheep. They somehow represented the old commons area of the town. 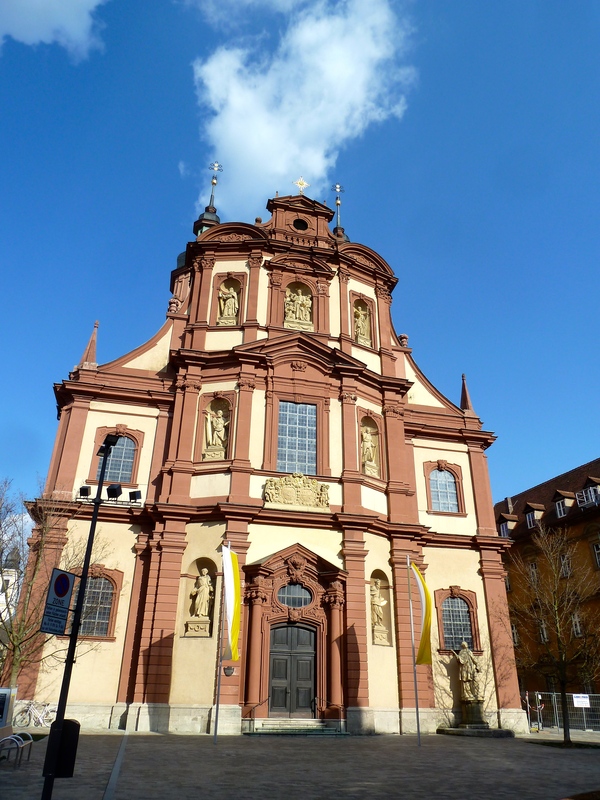 Würzburg is home to a whole host of historic churches. I passed the Augustinerkirche from 1741, and the famous Marienkapelle from 1480. 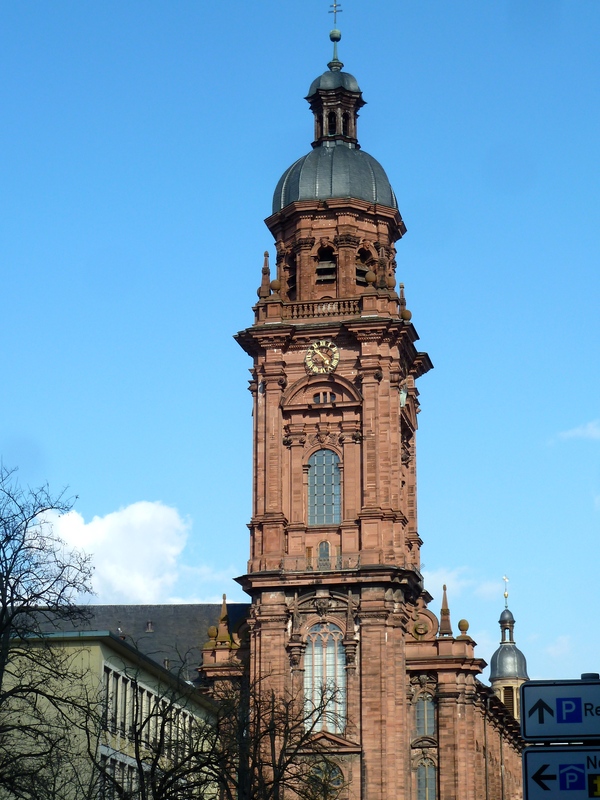 There was also the Neumünster basilica with its ornate Baroque façade from 1716. 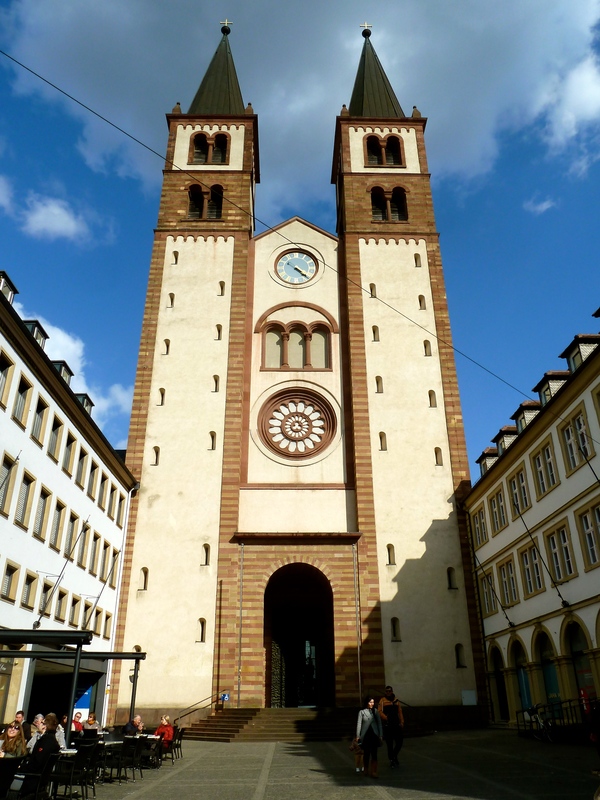 Next door was one of the symbols of Würzburg, Dom St. Kilian. 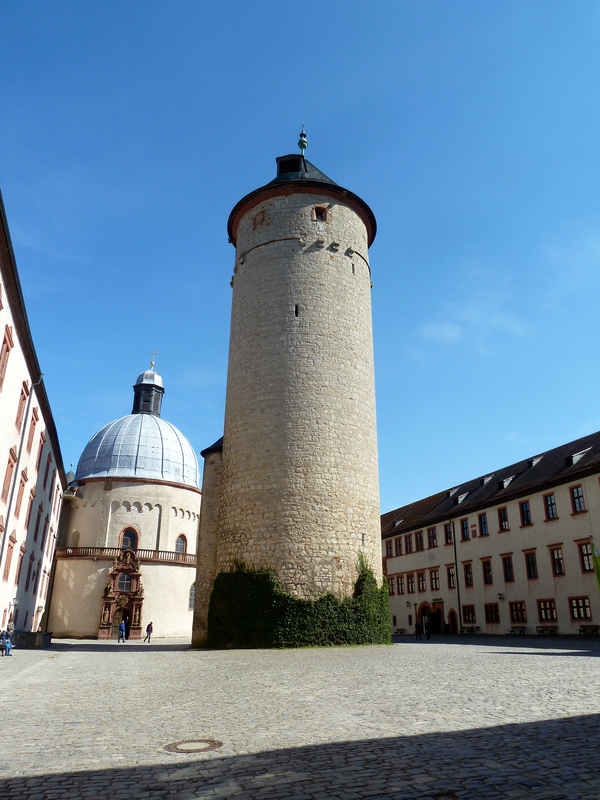 It is the principle work of 11th and 12th century German architecture. Construction on the cathedral began in 1040! The last church I saw wasn’t as famous as some of the more centrally located ones, but it was my favorite. Simply listed as St. Peter, there was something really striking about it for me. It was probably due to the fact that I had the place to myself. Everyone else was off celebrating Easter Monday, so I got to enjoy a few minutes of quiet reflection alone. Pictures do not do the inside of this lovely church justice. I also passed the Alt Universität (old university) with its tall tower. The same Julius Echter as before founded it in 1582. 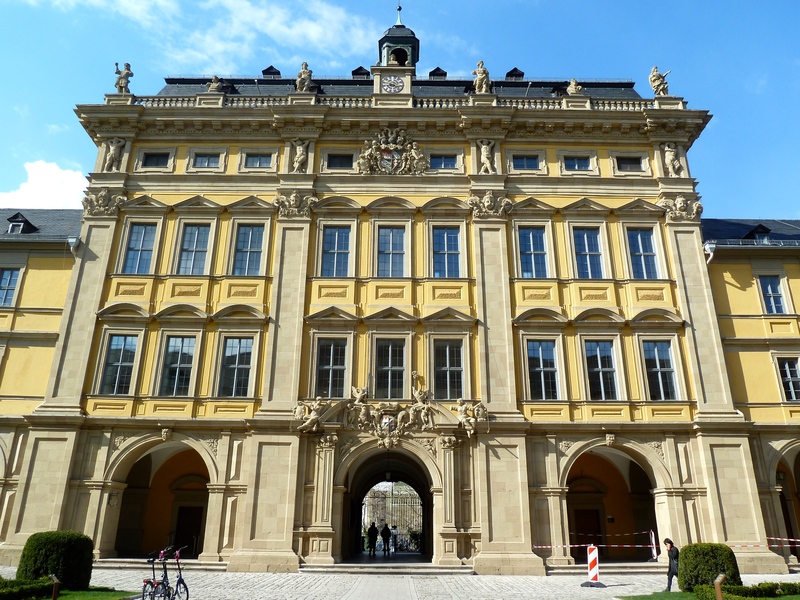 Since then 14 Nobel Prize winners have come from the University of Würzburg. So, I guess it’s a pretty good university. Honestly, Würzburg was one of the most delightful towns I have ever had the pleasure to wander through. The buildings were beautiful and the atmosphere was so welcoming. I easily lost several hours strolling down the cobblestone streets. My walking tour was, fortunately, not quite over. The next day I set out to walk over to see the main attraction: the Residence. 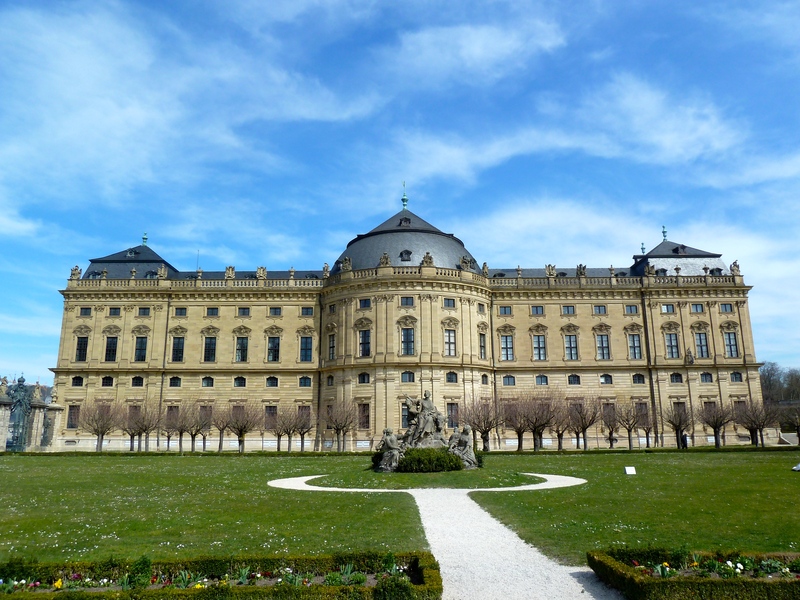 This Baroque palace was built from 1720-1780 as a new home for the Würzburg Prince-Bishops. What on earth is a Prince-Bishop? Well, let me tell you the story I heard on my tour of the Residence. In the 12th century, Emperor Frederick Barbarossa was the Holy Roman Emperor. He had a wife, but he didn’t like her very much, and they had no children. He wanted a divorce. But the Pope was not really supportive of Emperor Frederick’s wish to get rid of his wife. 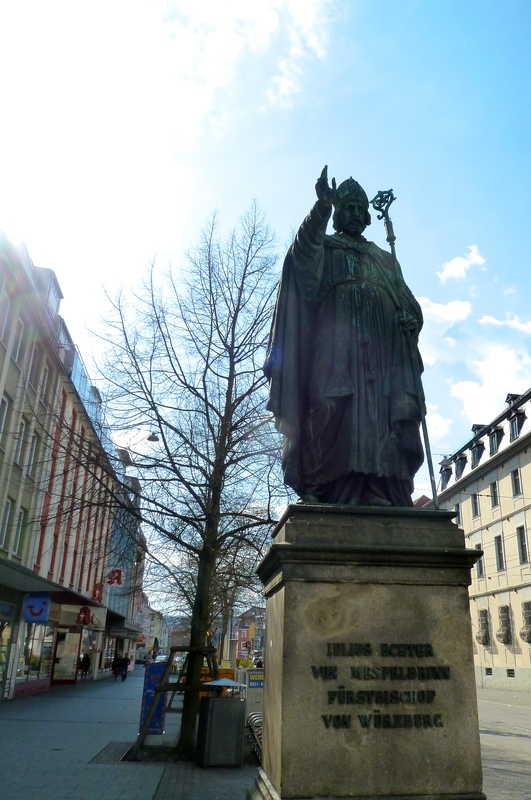 So, the Emperor asked the Bishop of Würzburg if he could talk to the Pope, and get him to grant the Emperor a divorce. 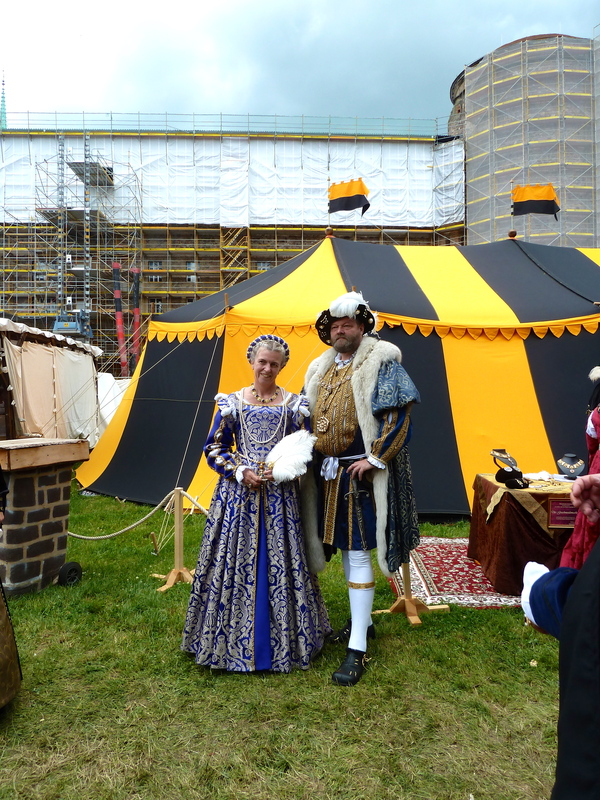 The Bishop did, and he succeeded in getting the Emperor not only a divorce, but also a beautiful, young, new wife. His new wife was somewhere between 12 and 14 years old. This caused a stir, but the marriage went on as planned. The new couple was very happy and had 11 children together. 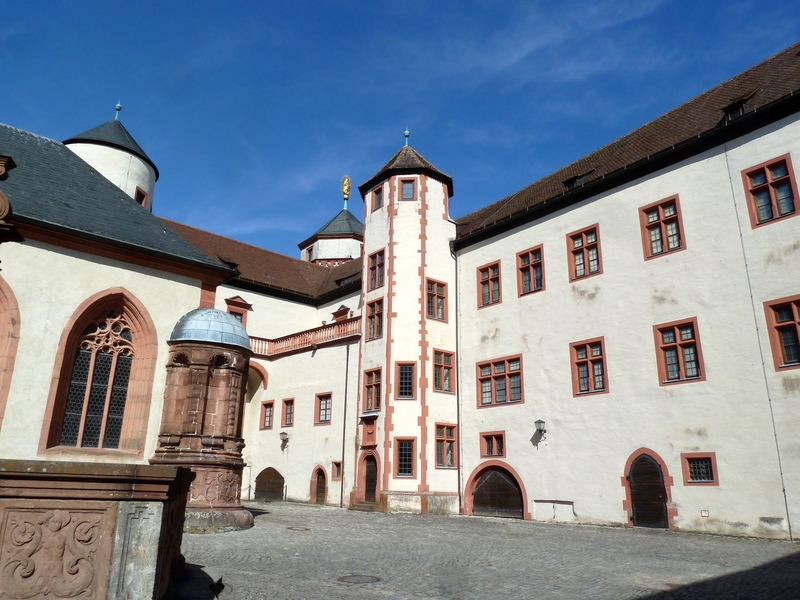 As a thank you for all of his help with the Emperor’s marital troubles, he gave the Bishop of Würzburg another title and some land. Thus, the Prince-Bishop was born. The Prince-Bishops were pretty powerful. They had land, money, and the full weight of the Catholic Church behind them. It follows, then, that their home was a display of this power. 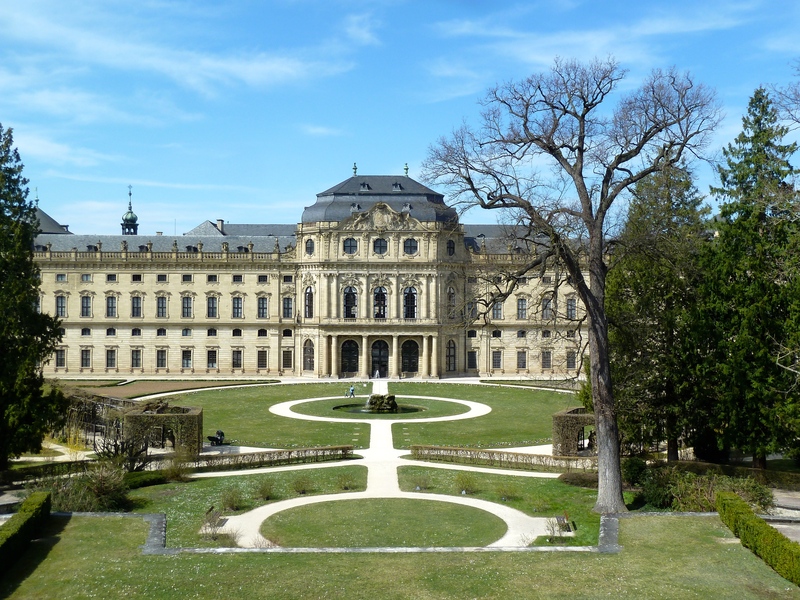 The Würzburg Residence was certainly not short on showmanship. When you enter the grand staircase there is a huge fresco above you. At 18 by 30 meters, it is the largest painting on earth. Painted by Venetian painter Giovanni Tiepolo, it depicts the entire world, as it was known at the time. There are some pretty obvious gaps in knowledge, since there are only four continents. Many of the exotic animals are also clearly new to the painter. My favorite was an ostrich with human legs. What follows the Grand Staircase is room after room of increasing splendor. Only two of these rooms, plus the staircase, are original: the White Hall and the Imperial Hall. The rest, along with 95% of the town, was destroyed in 1945, when the city was bombed during World War II. All of it has been amazingly rebuilt. There were a few rooms that detailed the process of reconstruction. The work and time that went in was astounding. I’m just glad that it was decided that these landmarks were worth rebuilding, because visiting them was incredible. After my tour, I took a stroll through the gardens and took pictures. Since it was such a nice day, I wanted to stay out and enjoy the sunshine. The hostel receptionist had suggested that if I enjoyed hiking, I could walk up to the Marienburg Festung (fortress) across the river. I don’t enjoy hiking, but it was more of a walking trail, and I wanted to see the fortress. My walk began with crossing the Alte Mainbrücke (old bridge). 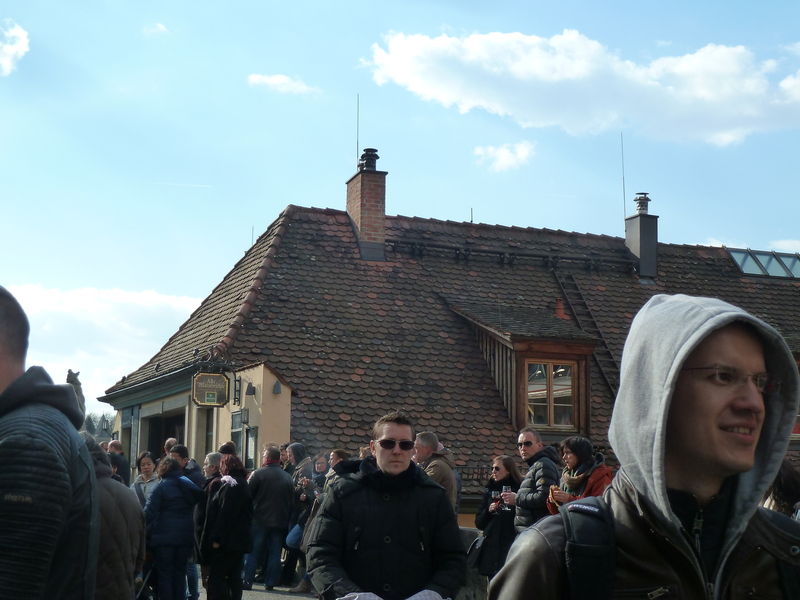 It was quite crowded with people out enjoying some regional wine in the sunshine. 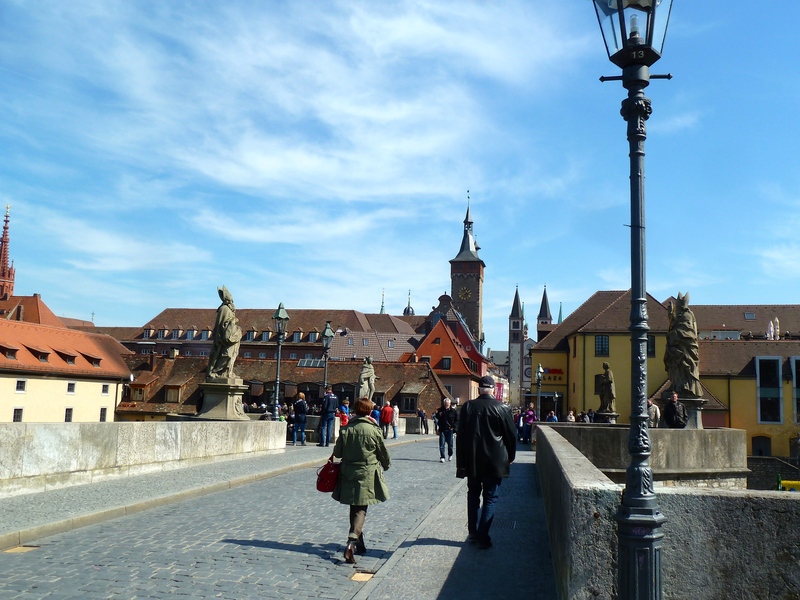 The bridge is also full of statues of Saints from around 1730. From the bridge I also got a nice view of the fortress. Somehow, while following the marked trail through town, I got quite lost on my hike. 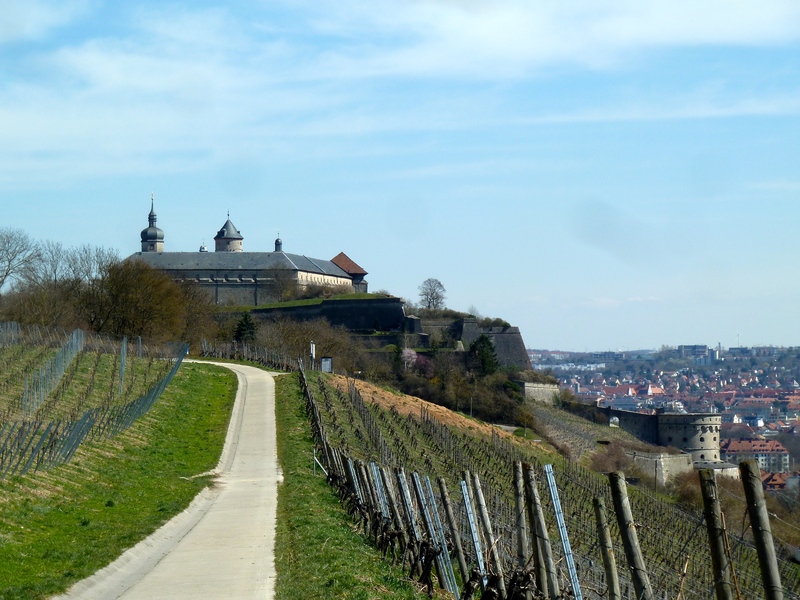 What I ended up finding was the vineyard trail that led me to the fortress. I thought the trail was closed, so I felt fortunate to get to see some of it. 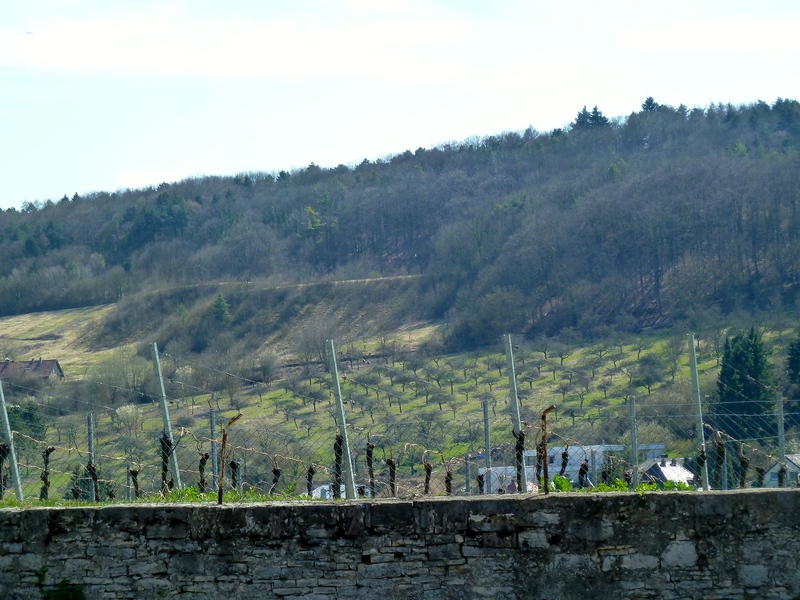 The rolling hills, filled with green grapevines were very peaceful. Eventually, I reached my destination: the Marienburg Festung. They believe the first fortress was built on this site in the 8th century! 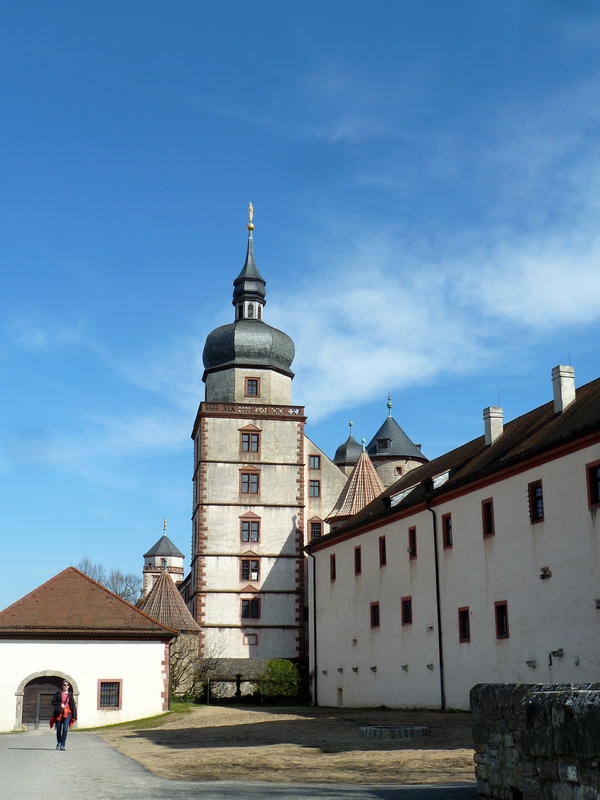 The Würzburg bishops built the beginnings of what stands today around 1200. This large fortress/castle was their home until the Residence was built. Much of it also had to be rebuilt after the destruction of WWII. 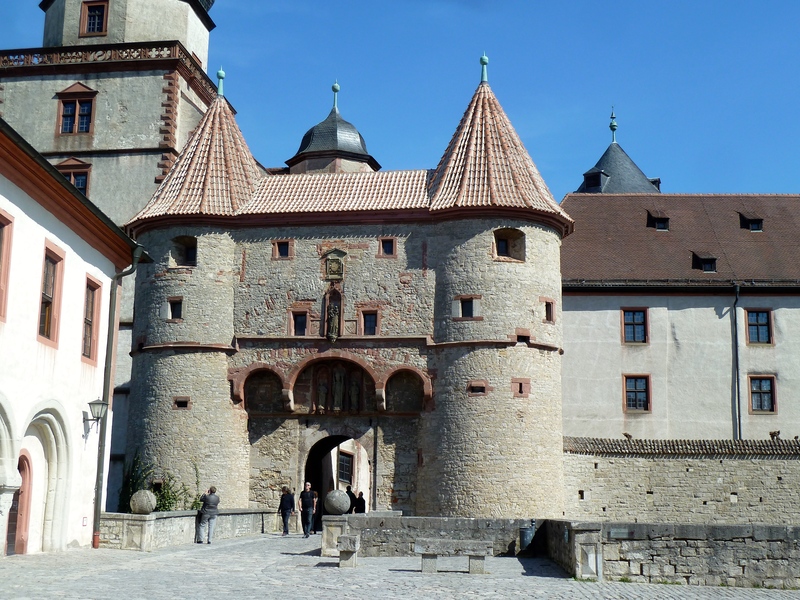 The complex was sprawling, full of towers, walls, and gates. One if the best spots in the fortress was the Prince’s Garden, with a panoramic view of the city across the river. While I was there, I visited the Prince’s Building Museum, to see some of the inside of the building and learn a bit of the history. The decoration here was much more sparse than at the Residence. Seeing the former home of the Prince-Bishops made the opulence of the Residence even more remarkable. The museum was a bit text-heavy for my liking, but they did have a large tapestry of the Echter family, which I found fascinating. Julius Echter was the most famous of the Prince-Bishops ruling from 1573-1617. There was also an exhibit of the elaborate robes worn by the Prince-Bishops, and an exhibit about the history of Würzburg as a town. But no pictures allowed :(. I had worn myself out hiking up to and exploring the fortress. Luckily, the bus to town had started running just the day before. I bid goodbye to the imposing fortress, and rode back into town for one last look around. 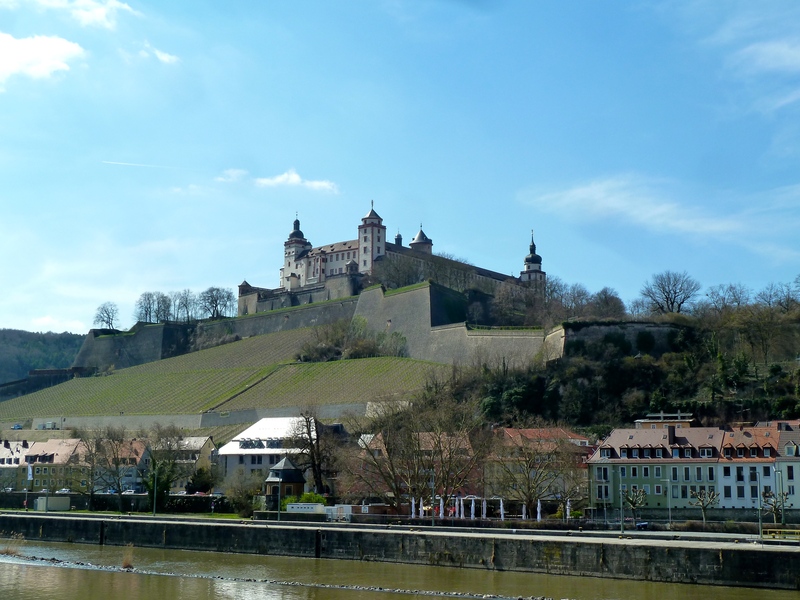 Full of history and charm, Würzburg was one of the highlights of my trip. I’ve always loved big cities, but sometimes small, enchanting towns are absolute jewels. The main highlights of the city did not disappoint, and there was so much more to discover. I hope I can come back some day. 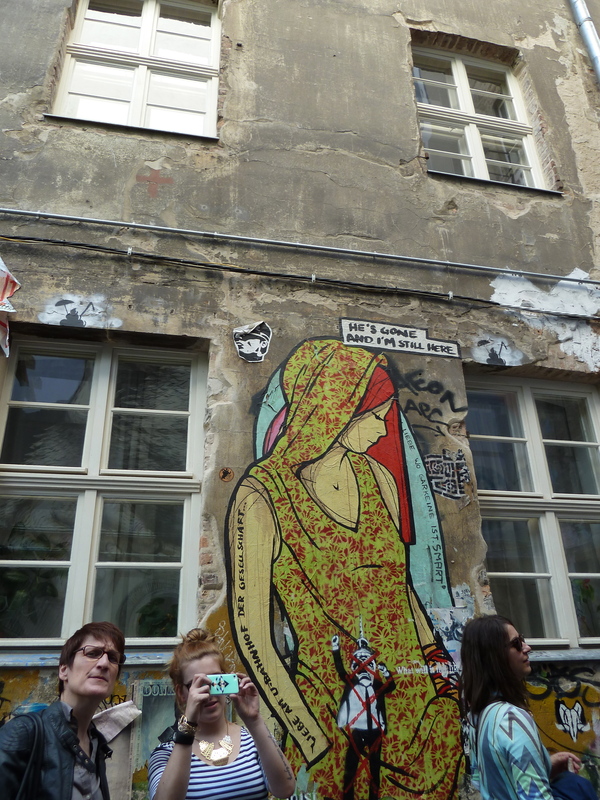 While I was in Berlin, my group also took a street art and graffiti tour with Alternative Berlin. I wasn’t exactly sure what to expect, but I ended up finding it fascinating. Our tour guide was excellent, and she taught us about the history behind graffiti tags. Graffiti tags usually involve a person or group painting something on a building or wall that represents their name. It started in the United States with Cornbread. He had gotten into some trouble and ended up in juvenile detention. There he complained so much about the dry dinner rolls, saying he missed his grandmother’s cornbread, that his nickname eventually became Cornbread. Then, one day he began painting it all over the walls. No one could figure out if it was really him, or someone trying to frame him. He gained some notoriety and moved on to bigger stunts, including tagging an elephant in the Philadelphia Zoo. Now people all over the world use tagging their name as a way to gain respect and attention. Our guide also pointed out various street art that we passed. 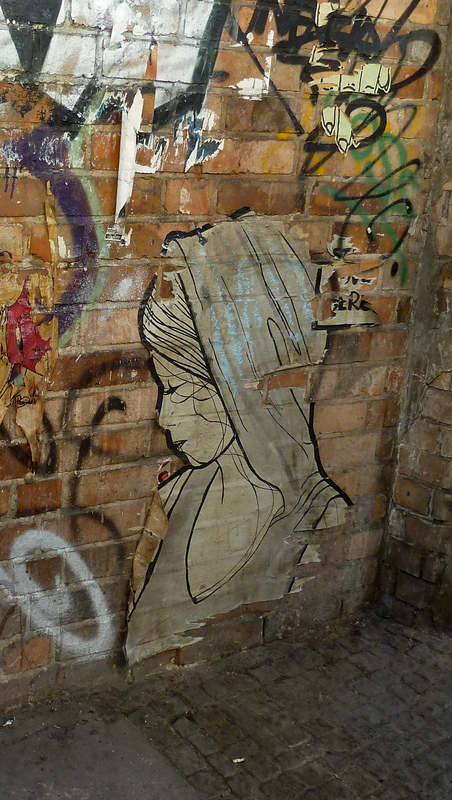 The art ranged from sticker graffiti, to yarn bombing, to full-scale paste up art. This post box has little yarn chicken feet. 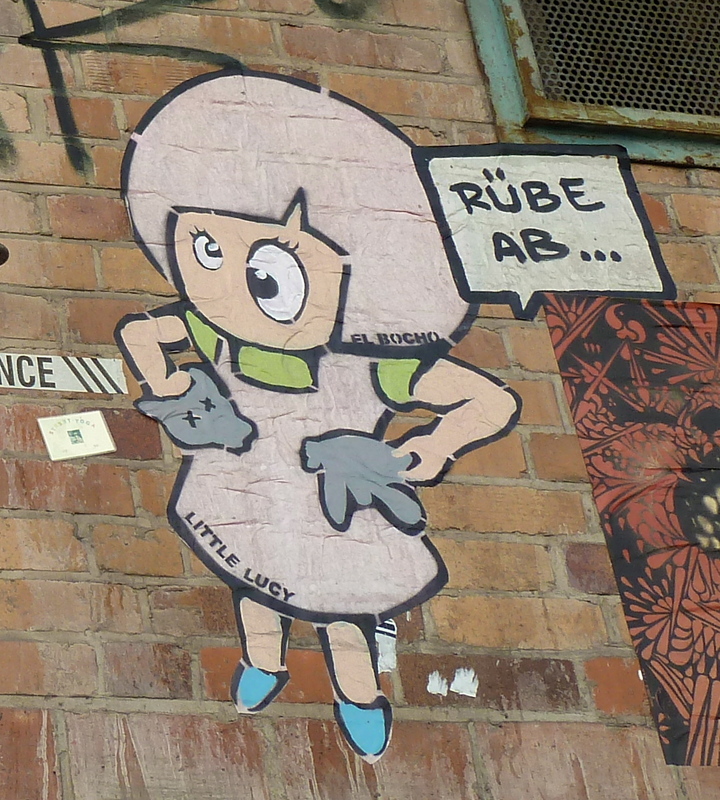 El Bocho (Spanish for little donkey) is one of Berlin’s most famous street artists. One of his very popular characters is Little Lucy. Originally, she was in a bland Soviet-era cartoon where she went on adventures with her cat. 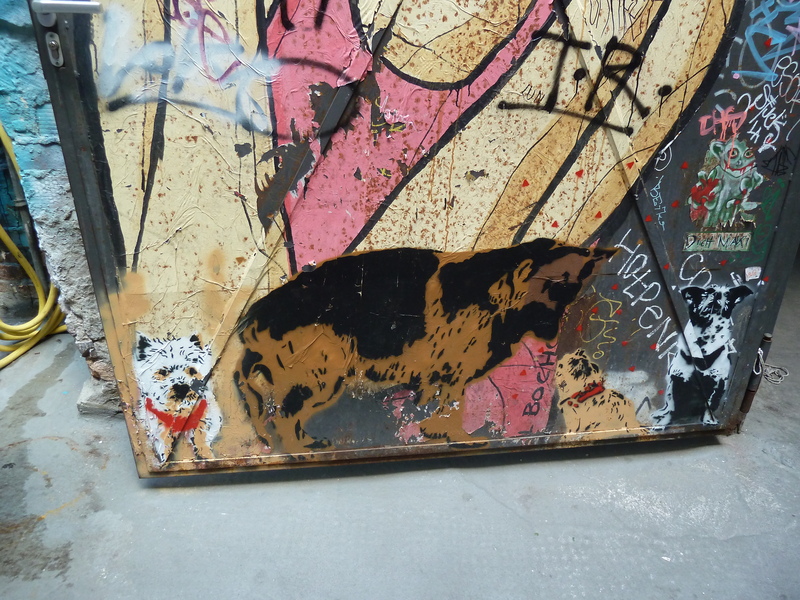 All that has now been flipped on its head by El Bocho, who depicts Little Lucy’s new adventures of trying to kill her cat in many creative ways. Little Lucy makes cat soup. Another character of El Bocho’s does not have an official name, but is called the Citizen or simply the Girl. She is in love with jthe city of Berlin. Originally the pasted up paintings are very colorful, but as time passes the color washes off and she turns grey and fades away. The symbolism is very powerful. A Girl who has been posted for awhile. If you want to learn more about El Bocho you can visit his website or get more info here. There was also a visiting street artist who had left some pictures behind. 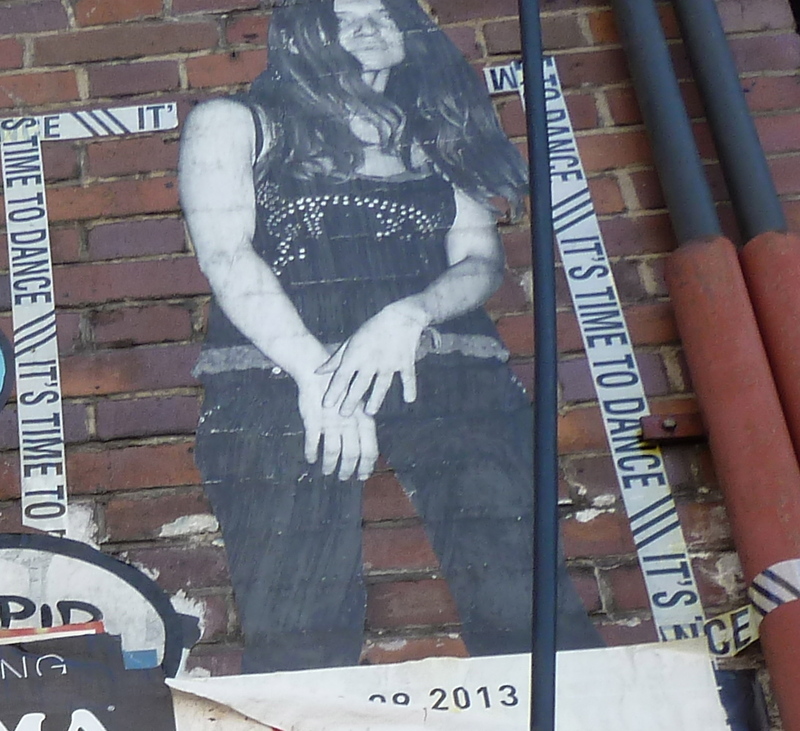 They were all approximately life-sized paste ups of people partying and dancing taken from public Twitter, Instagram, and Facebook profiles and surrounded by caution tape printed with “IT’S TIME TO DANCE”. I thought they were fun, even if they had an undercurrent of caution. It was also very interesting that a street artist would so directly take on social media as a topic, since that is how most works of street art get shared. 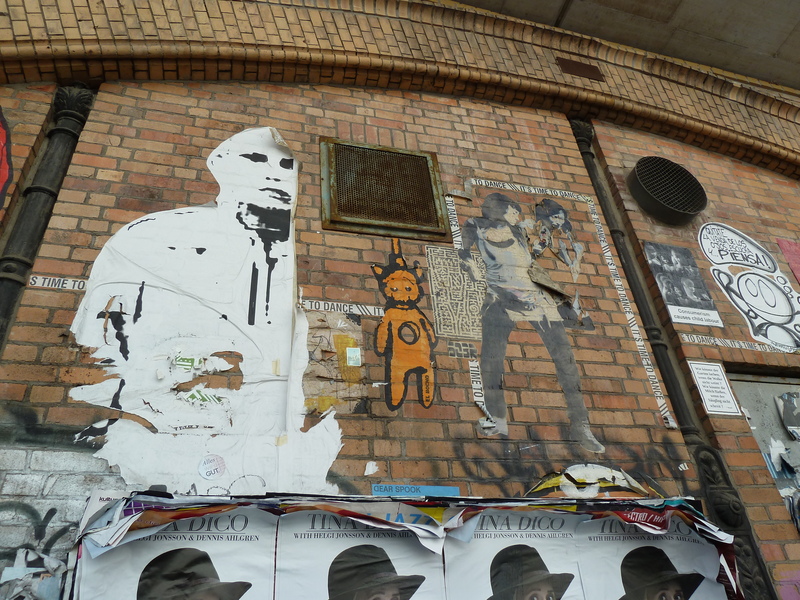 You can see an album of some more of the works in Berlin here. 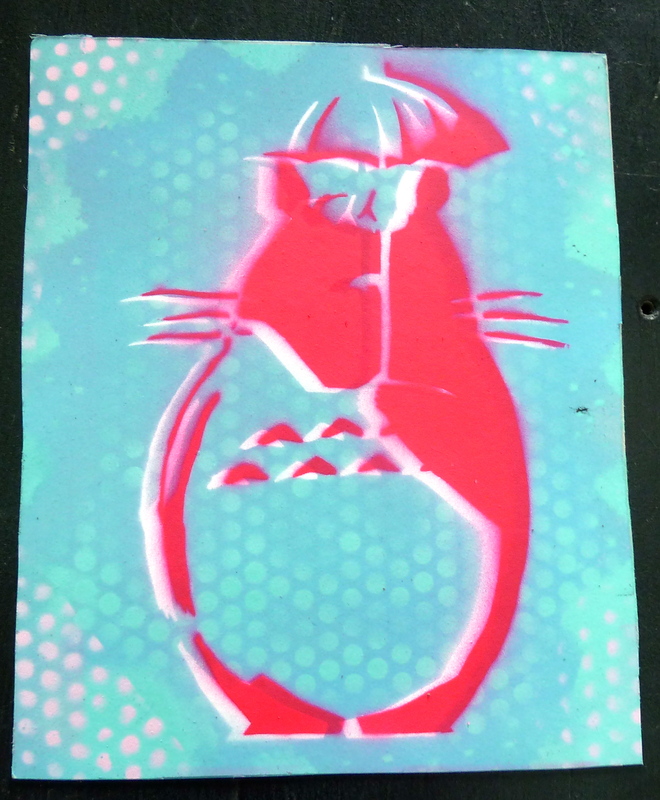 When we finished our tour, we got to go back to a workshop and make some spray paint graffiti art ourselves. 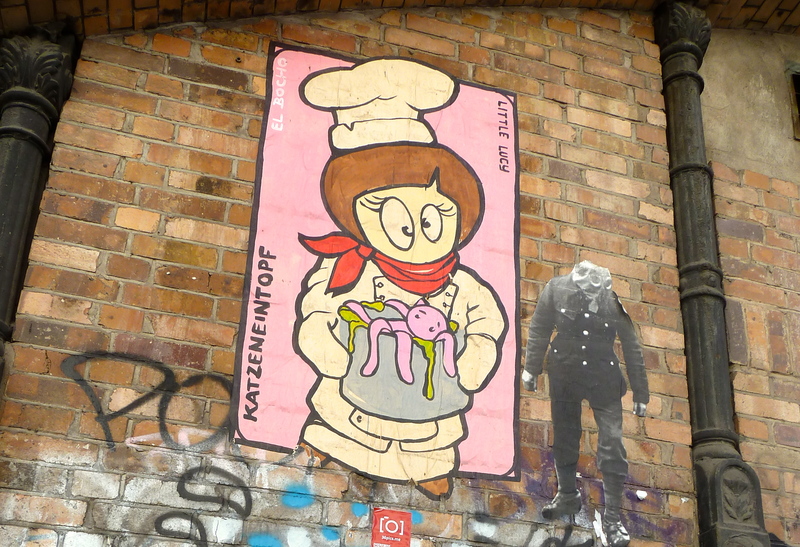 Without this tour I might have missed out on the rich culture of street art available in Berlin, and subsequently, some of what makes the city shine, plus it was a great time. 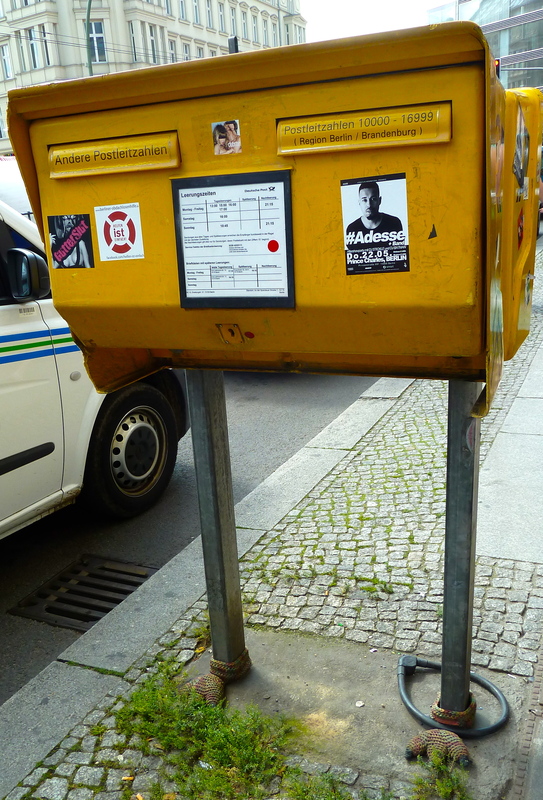 I may have gone to Berlin a little while ago, but I thought you might still be interested in hearing about it. 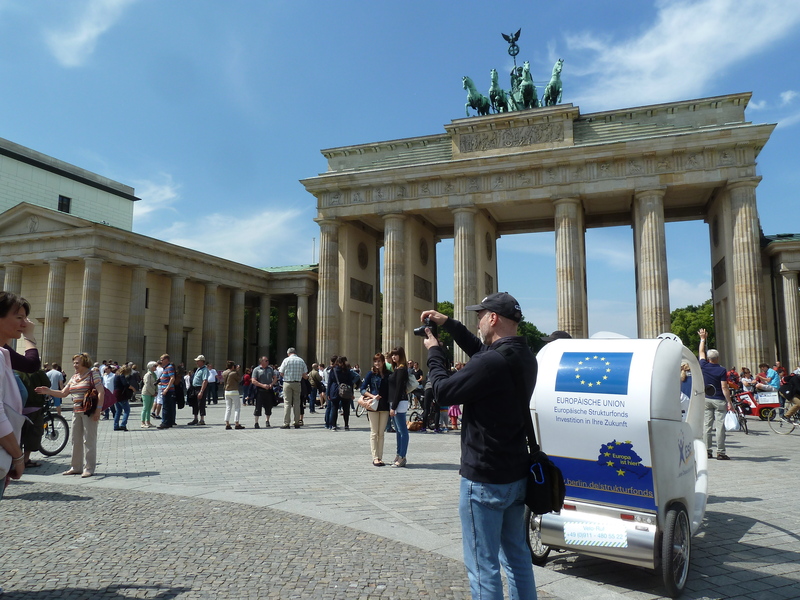 Most of the sights I saw in Berlin were concentrated in the area between Potsdamer Platz and Alexanderplatz. 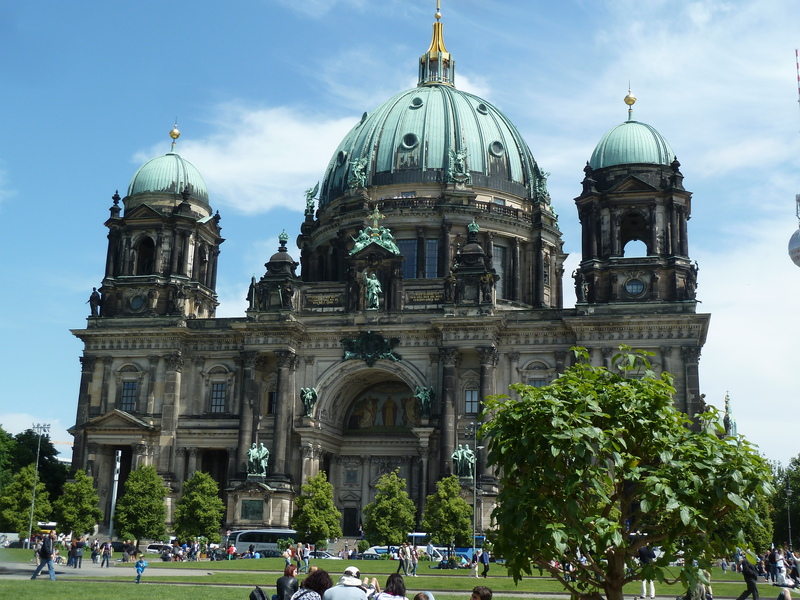 Just walking down the street to the hostel, we passed Humboldt University, Bebelplatz, the Holocaust Memorial, the Brandenburg Gate, the Reichstag, Museuminsel, and the Berliner Dom (a cathedral). We ate lunch by the huge Fernsehturm (Television Tower) in Alexanderplatz, where there were lots of shops selling clothes and touristy knickknacks. 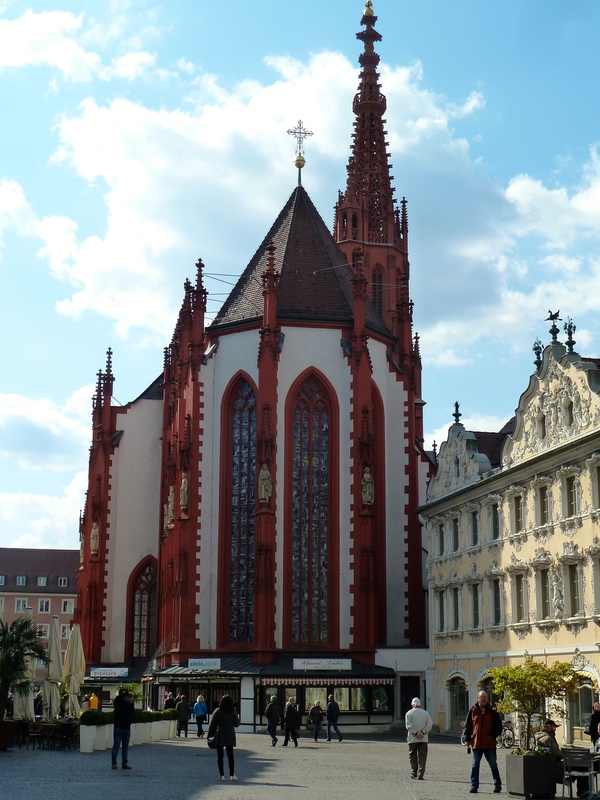 If you walk past the massive amount of construction being done, you can see the Rathaus (the old courthouse) and head over to the Nikolikirche (St. Nicholas’ Church). The area over there is much quieter than the surrounding areas, and you can get great views of the river Spree. 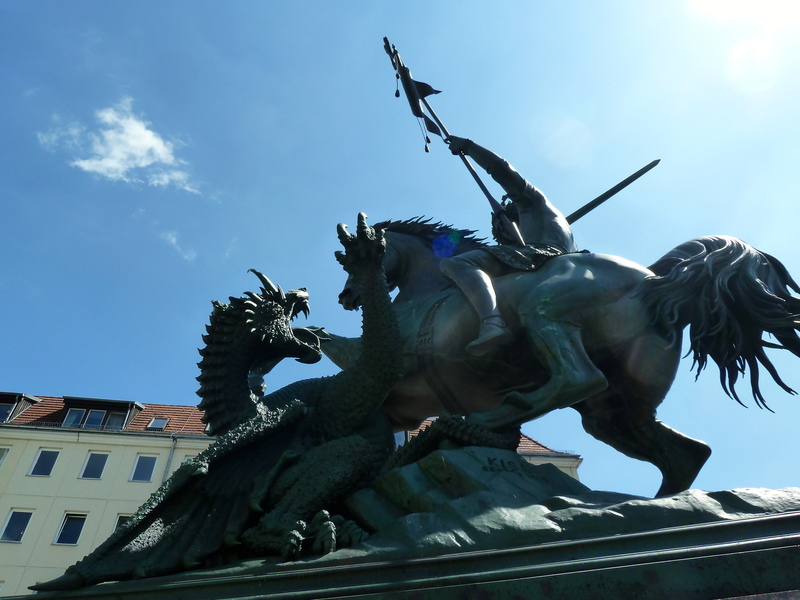 I also liked the cool statue in the square of St. George and the Dragon. 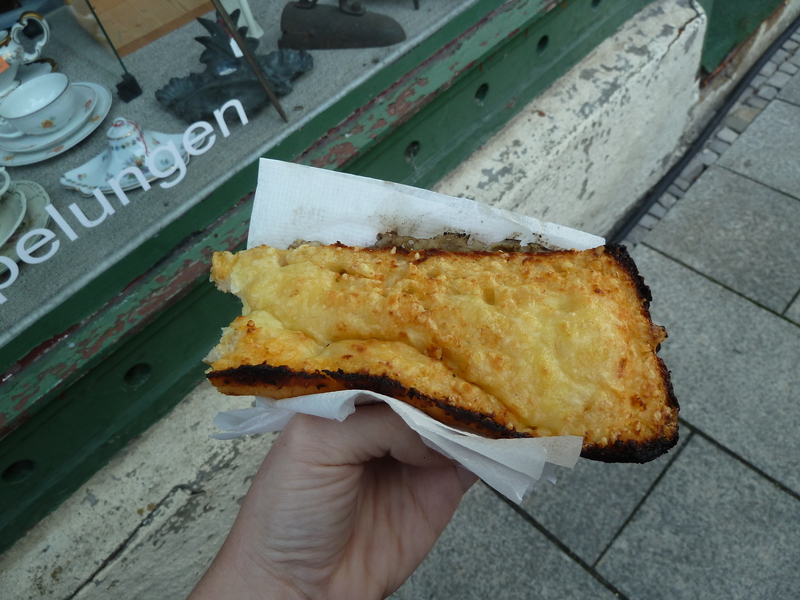 The food stands in Berlin were surprisingly excellent. Pretty much everywhere we went there were little stands selling Currywurst or Doner. Guys even stood on street corners wearing Bratwurst grills on their backs. Even better, all of these “snacks” were cheap and filling. 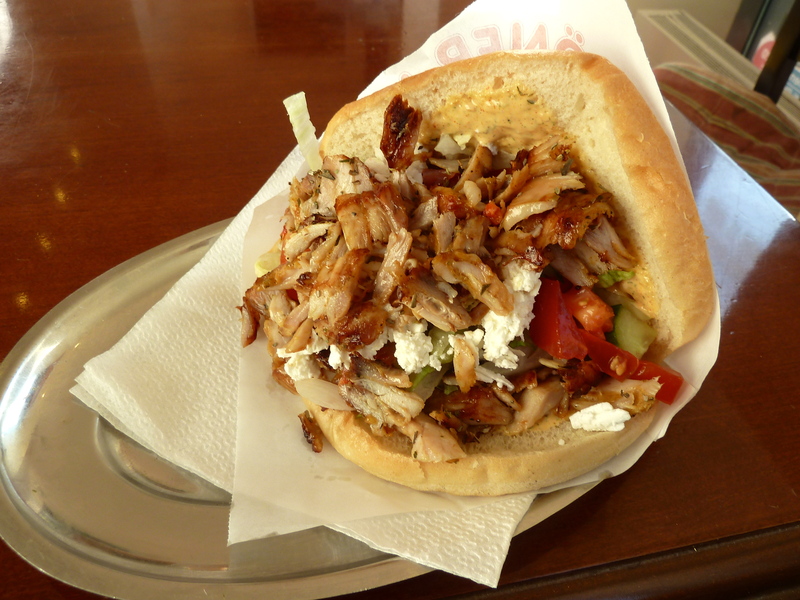 I became quite attached to Doner during my time there. Every stand had a different recipe for this Turkish, bread, meat, and vegetable pocket, but they were all delicious. 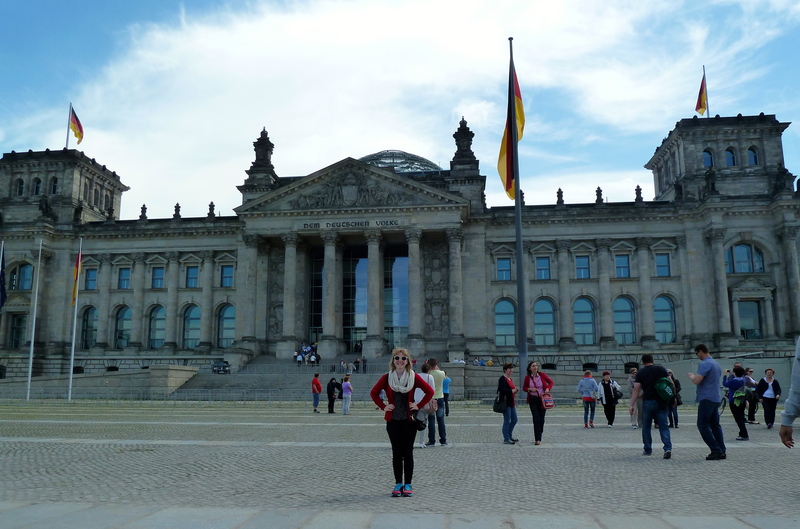 One day while in Berlin we got tickets to Museuminsel. 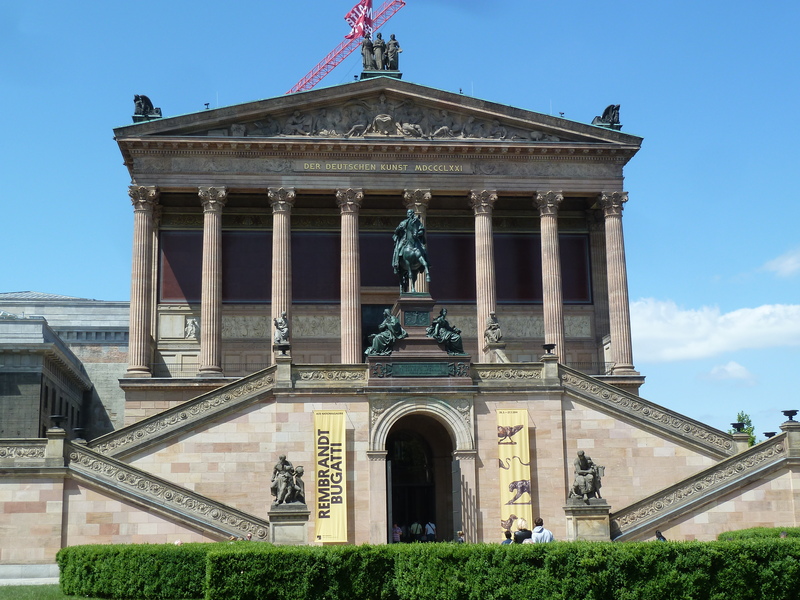 You can buy one ticket that is good all day at all the museums on the island, plus several others in Berlin. 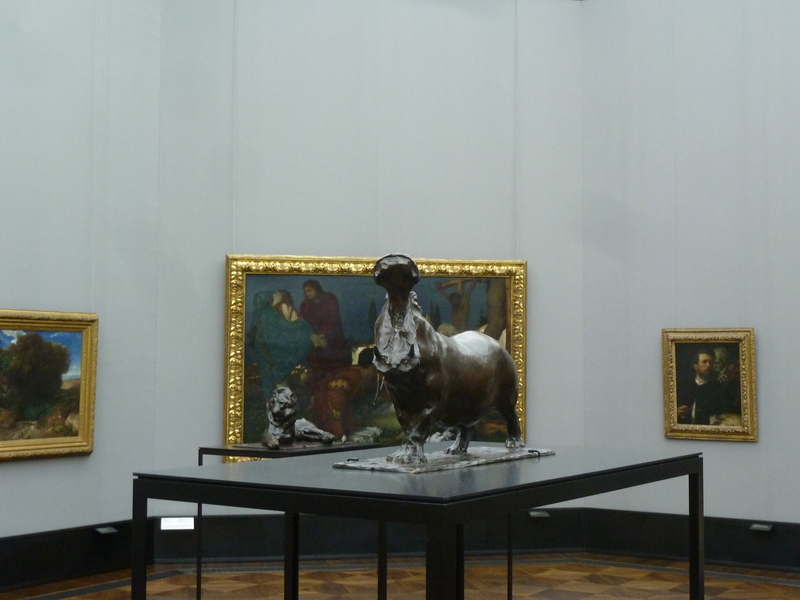 We visited the Old National Gallery and the New Museum. The National Gallery was full of beautiful paintings, featuring a huge selection of works by Adolf Menzel and even some French Impressionists, and a special exhibit of sculptures by Bugatti. 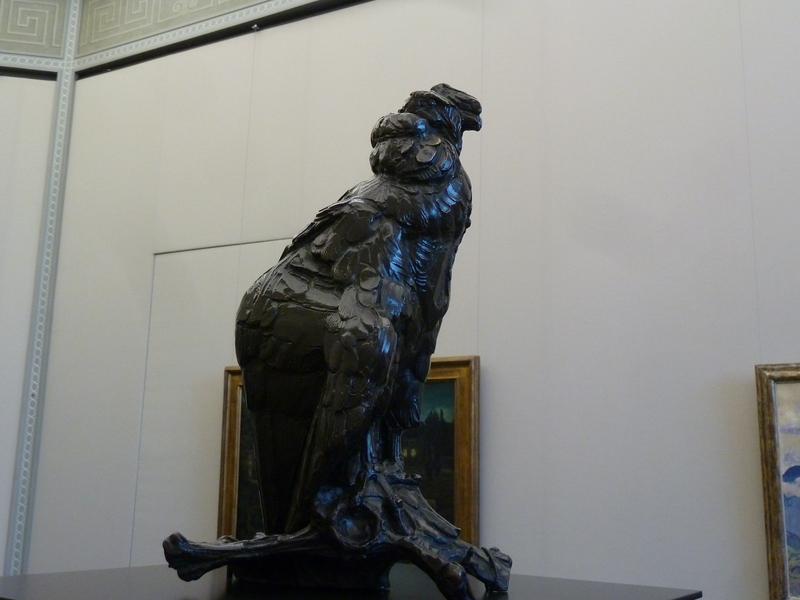 He was the brother of the famous automaker, and sculpted amazing animals out of bronze. It was interesting to learn how his lifelike animals were connected with the rising popularity of public zoos in the late 1800’s. The New Museum, ironically, held mostly ancient artifacts. The most impressive collection was their Egyptology collection. I had no idea that Berlin has long been one of the centers around the world for Egyptology studies. The building itself was also an attraction. After World War II it was rebuilt, but the ruins of the old building were left and simply built around. I thought the effect was captivating. 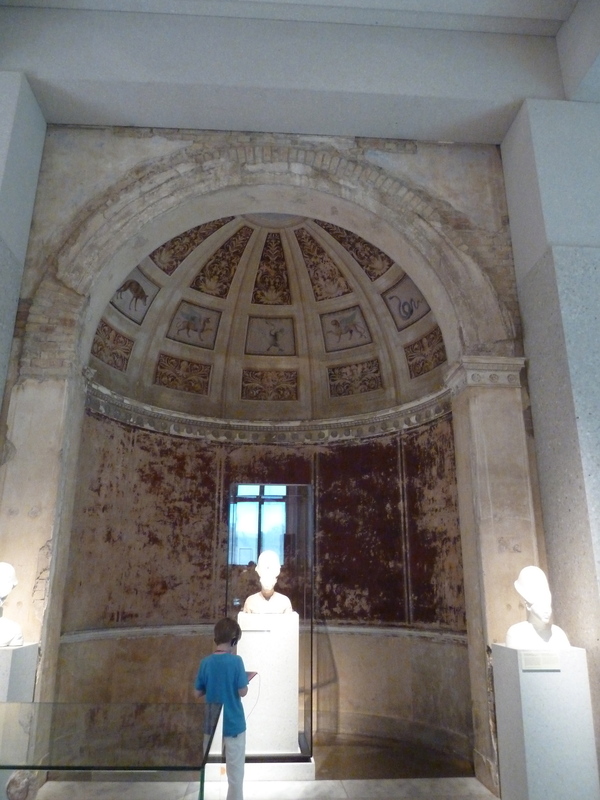 We had no time or energy left to explore the other museums around, but I hope to see the Pergamon on my next trip. It was mostly closed for remolding this time. 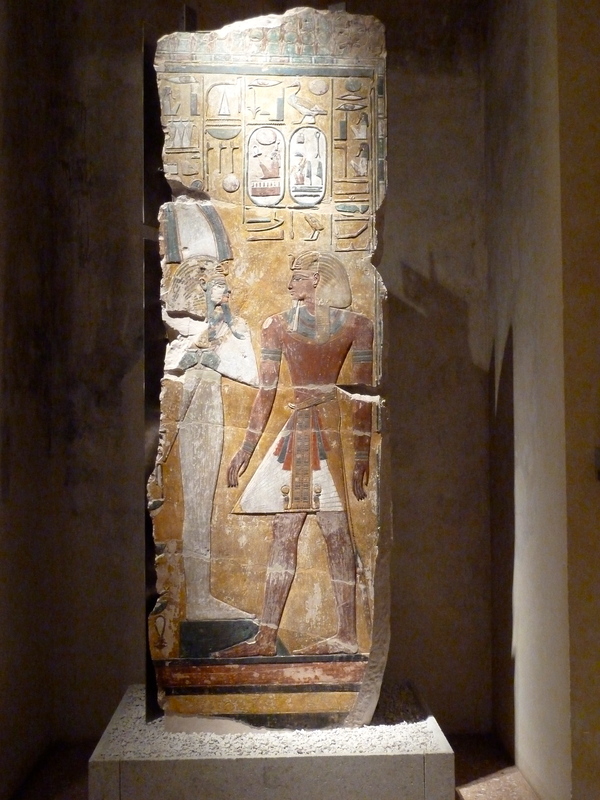 An Egyptian artifact that is still this colorful 3000 years later. After our day in Dresden we took a train about 40 minutes out to Königstein. 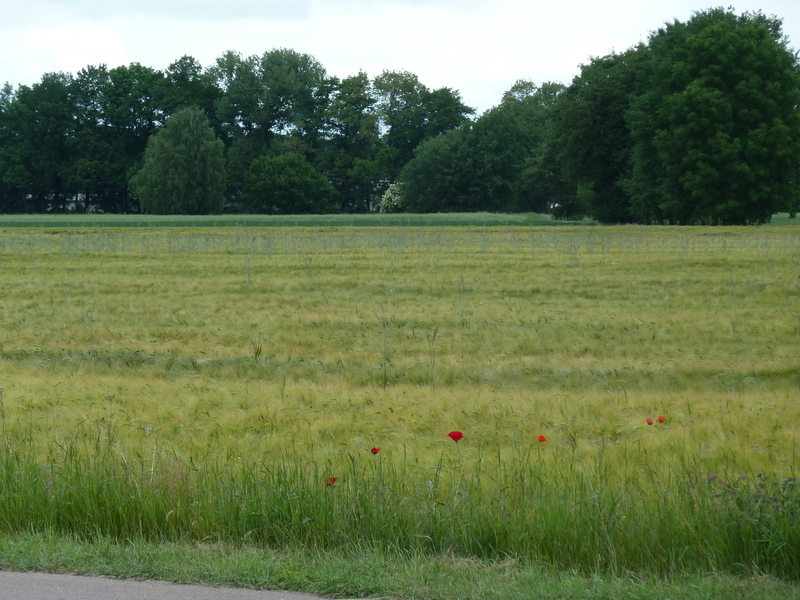 The ride took us along the River Elbe past beautiful rolling hills and tiny, picturesque villages. 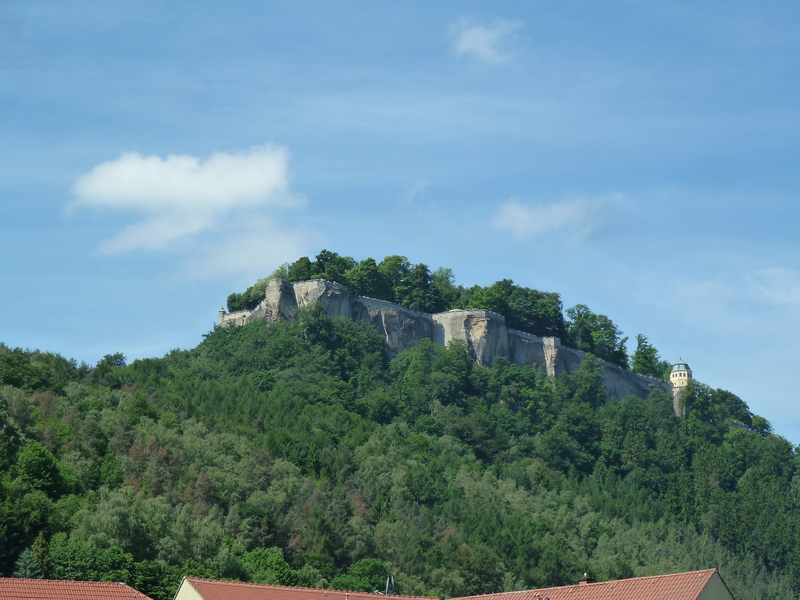 Once you get off the train at the Königstein station your journey to the fortress has truly begun. From there you walk to the center of town to get on a double decker bus. 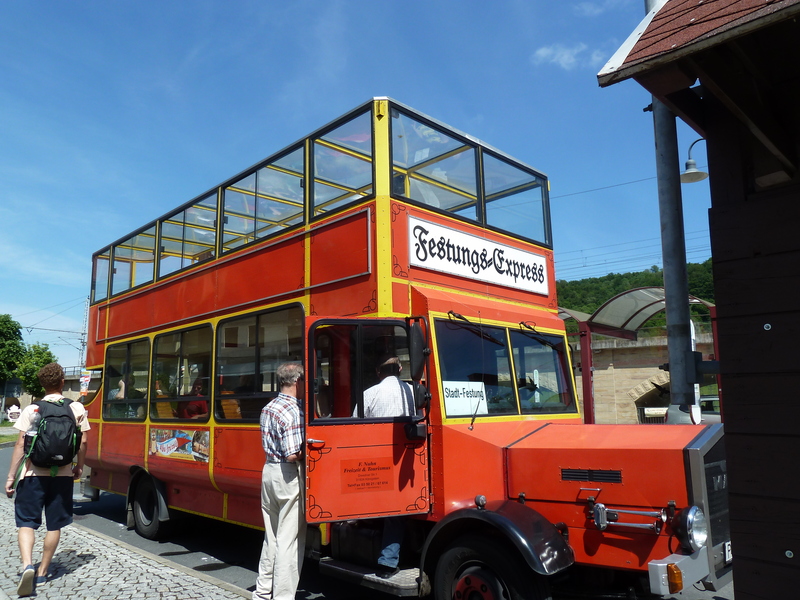 That bus can only drive about halfway up the mountain, so you have another stop where you get on a “train” that is really a tractor pulling some cars.This drops you off where you buy tickets to the fortress. Then you get to walk up the path leading to the entrance. It is quite steep, but gives you a pretty good idea of why the fortress was never taken. Just to get from the river to the gate is quite the feat, not to mention getting past the castle’s formidable fortifications. Originally built in the 13th century, this fortress was constantly being renovated to be stronger and more shell proof, right up until WWII. I took the self-guided audio tour with a friend, but the structure was so huge that we only managed to hit the highlights. 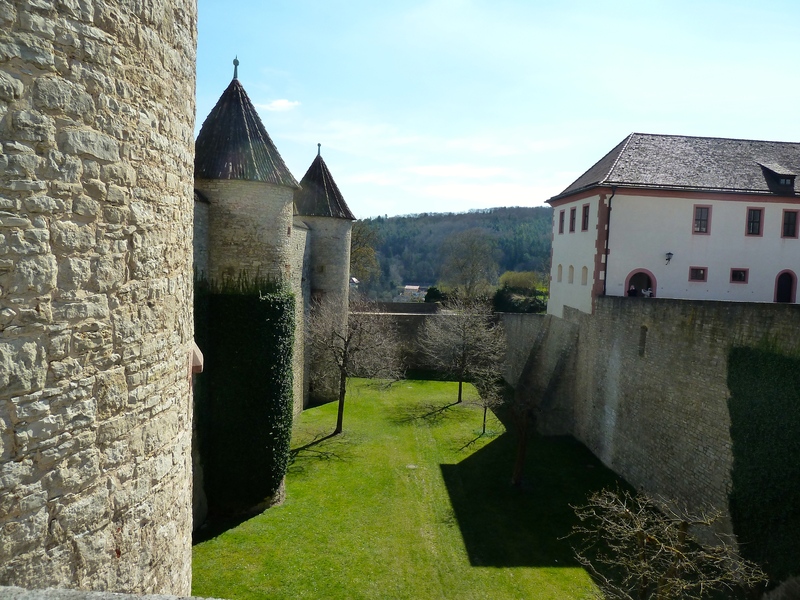 The best part of the fortress was the amazing view from atop the walls. Other than the beautiful landscape, there were plenty of interesting parts of the fortress itself as well. In addition to the 500 foot deep well and 13th century chapel, there was also a wine cellar where Augustus the Strong had the world’s largest wine barrel built. It held over 50,000 gallons of wine! A lithograph of what the barrel used to look like, courtesy of Wikipedia. 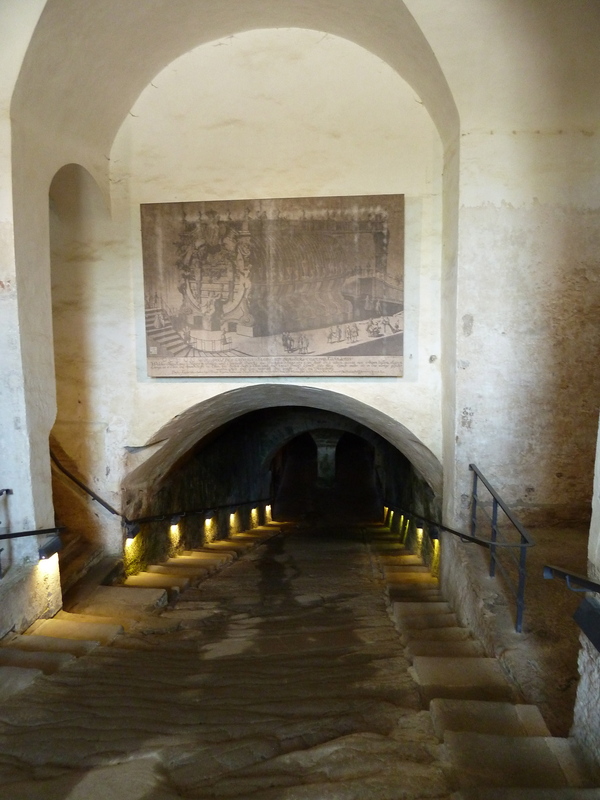 One of the main uses of the fortress was to store gold, silver, and precious artworks during times of unrest. For this purpose a treasury house was built with walls over six feet thick and a cellar with mechanical carts that could transport the barrels of coins around. My favorite building on the property was Fredericksburg (Frederick’s castle). An original part of the fortress, Augustus the Strong had it renovated in 1731 to reflect the modern Baroque style and used it to house small court meetings. One special feature that he added was a mechanical table that functioned basically like a food elevator from the kitchen below. His guests were very impressed. A visiting royal even asked for the plans to build his own. My attempt at taking a picture of the table. One night at dinner a page indulged in a few too many glasses of wine. He was so sleepy afterwards that he set off in search of the nearest bed. Soon he found a nice flat surface near the ground. Since it was dark and he was more than a little intoxicated, he did not realize that this flat surface was actually an open window facing a 130-foot drop. The next morning, the king’s guards found him still fast asleep on the windowsill. When the king was told what was happening, he ordered his page to be tied, carefully to the sill and a parade of drums and trumpets to march by. That is what I call a rude awakening. Visiting the fortress was a lovely way to spend the day. I highly recommend it if you are in the area. It was very dog friendly, if you happen to be traveling with pets. It was not, however built on easy terrain. If someone in your group has difficulty getting around, it might not be the best option. Perhaps you could check out a day cruise along the river. 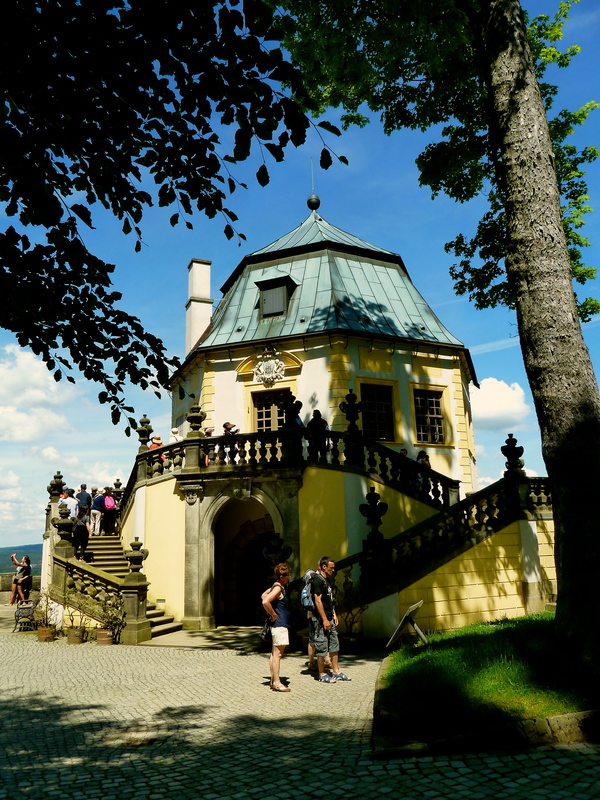 For beautiful summer scenery the fortress and surrounding area were a great day trip. When I left for Germany I brought a gift with me for my host family: real Texas salsa. They were a bit confused by the jar and asked me what they were supposed to put it on. I decided then that before I left I would make them a real Texan dinner, so they could experience Texan food. My mother always makes King Ranch Chicken casserole when she wants to impress guests with Texan food, so I emailed her for the recipe. For my last night in Wittenberg my host mother and I planned a small family party. This was to be the night that I debuted my Texan dinner. Two days before I carefully converted all of the measurements to metrics, translated the ingredients, and set off for the Super Market. That was when I discovered that I was going to have to substitute a lot more than corn tortillas and Ro-Tel. It turns out that canned soups are not very popular in Germany, and cream of anything is hard to find. My recipe called for both cream of mushroom and cream of chicken soups. I picked up two bags of Champignons Sause instead. The biggest shock, however, was the complete lack of cheddar cheese. I searched in three stores to no avail. In the end I had to fall back on “pizza cheese” a mozzarella blend that I hoped would at least melt well. 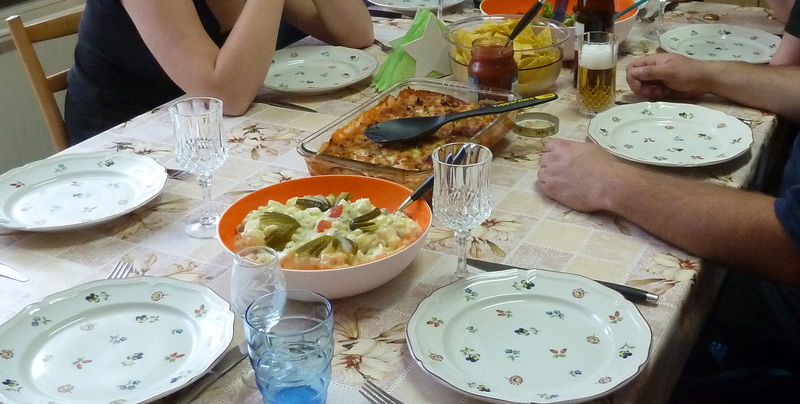 While I worked in the kitchen to assemble the casserole the day before (as it is supposed to sit in the fridge overnight), my German family and their guests watched me, baffled. “Are you putting the tomatoes in with the mushroom sauce?” they asked. Apparently Auflauf (casserole) is not very popular in this area of Germany, and it was seen as “very American of me” to put all of my ingredients together in one pan. But that was just the beginning of the adventure. The next day it came time to bake my casserole. It mostly just needed warmed, as I had cooked the chicken ahead of time. The original recipe, however, called for it to be in the oven for 90 minutes. In a stroke of luck, I checked it after about 30 to find the top about to transition from brown and crispy to burnt. After a frantic Skype call to my mother, who assured me that the general less creaminess of the mushroom sauce in comparison to cream soup lead it to cook faster, I went ahead and took it out. Her other tip had been to smear the top with butter. Fortunately, it turned out fine. My host family ate all of it, and claimed to like it. They like the salsa too. It was quite the lesson in cooking in other cultures. And I used to think it was hard to find Mexican food in South Carolina! Now I know that, even though the world is becoming more globalized, not everything that is normal to me is normal to everyone. Who would have guessed that making dinner would be such a cultural awakening? In large mixing bowl, combine soups, broth, tomatoes, salt and pepper. Stir well. Tear tortillas into 1 x 3 inch strips. Spray a large flat 13 x 9 inch pan with vegetable cooking spray. Spread a little of the soup mixture on the bottom on the pan. Add a layer of tortilla strips, then a layer of chicken and a layer of the soup mixture. Sprinkle with chopped onion and grated cheese. Repeat layers until all ingredients are used, ending with cheese on top. (so if you run out of something, just keep going until you have only cheese left) Cover with foil and refrigerate overnight. This helps to blend flavors so plan ahead and don’t skip this step for best flavor. At this point, the casserole can be frozen for later baking. Remove foil and bake in a 300 degree oven for 1 1/2 hours. Two weeks ago the weather was wonderful. Our class took an excursion to Bergwitz on Wednesday to swim in the lake there. 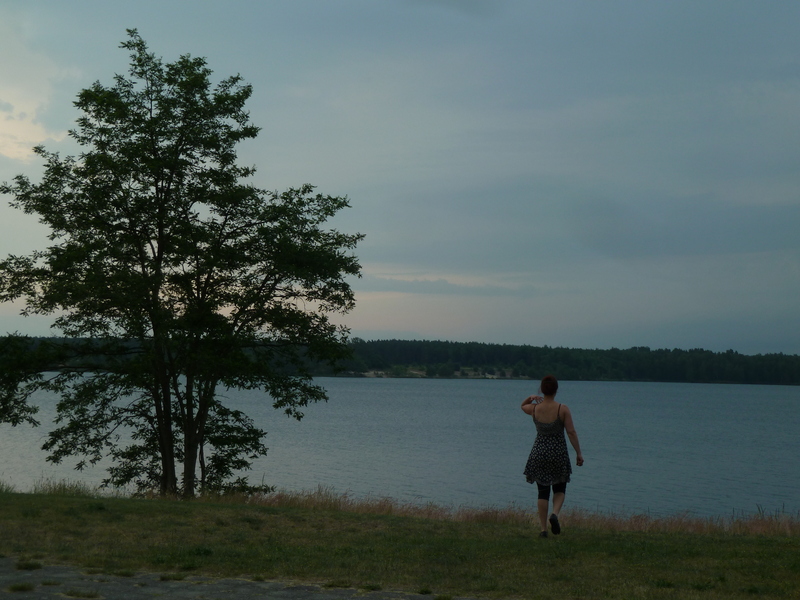 Of course, that was the day it rained, but we had fun anyway, and I got some pretty cool storm cloud pictures over the lake. 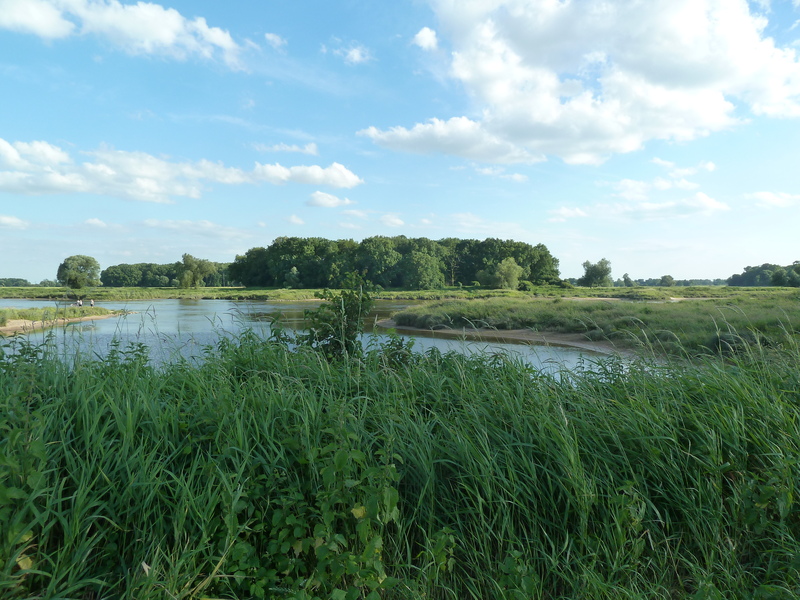 By Thursday the rain was gone, so, in a somewhat uncharacteristic move, I went biking along the River Elbe with my professor and my friend Shannon. The views along the river were lovely and the weather couldn’t have been better. But by far the most exciting event that week was Lutherfest. In 1524 former monk, Martin Luther, married former nun Katharina von Bora in what was the scandal of the decade. 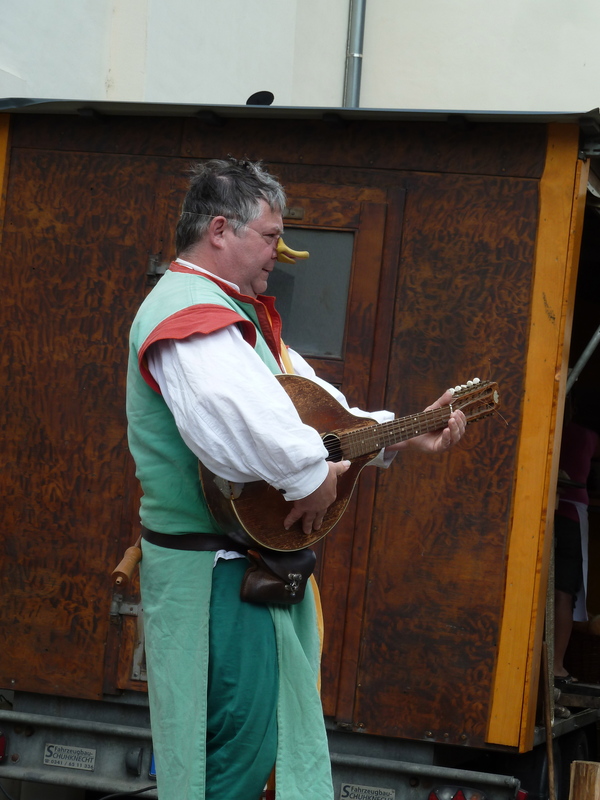 So naturally, the event is celebrated in Wittenberg every year with a medieval festival and plenty of beer. 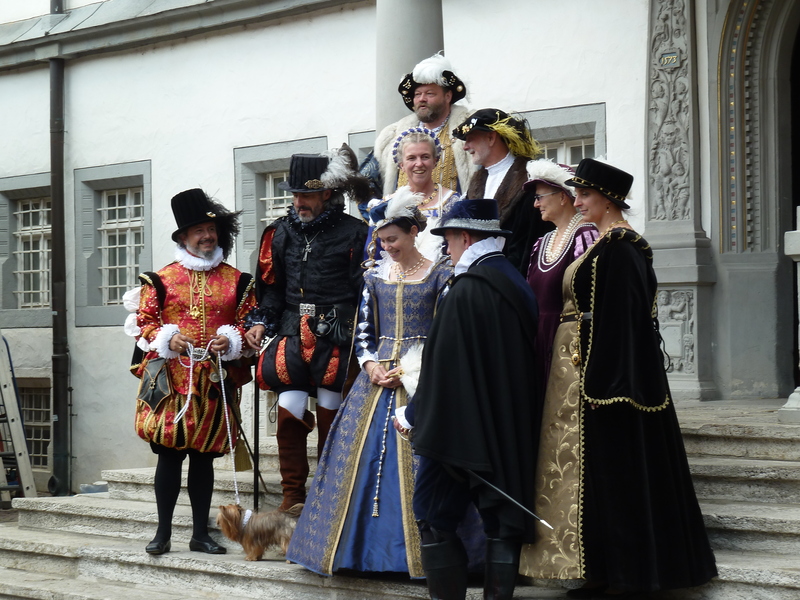 Over 100,000 people were in Wittenberg for the annual festival, and many of them dressed in medieval costumes. In addition to the costumes, the streets were lined with booths selling food and crafts. 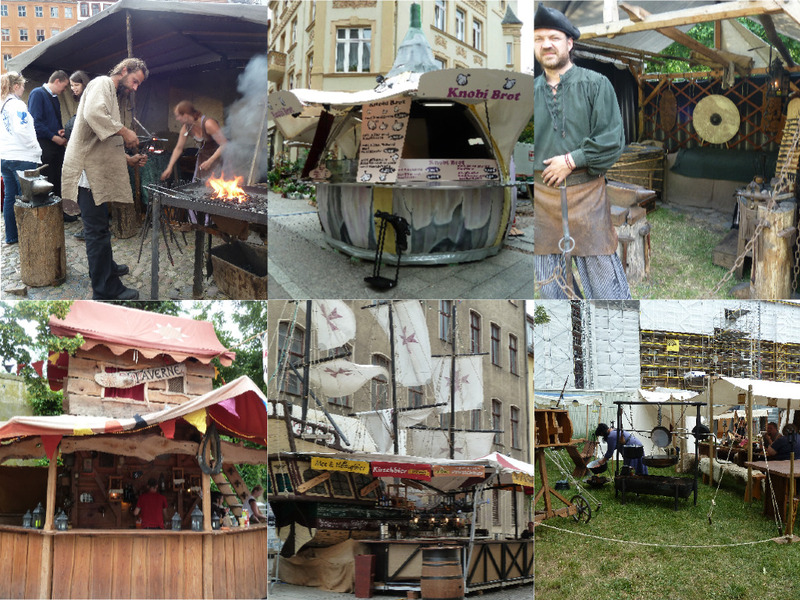 Some of them were even set up as medieval tents or blacksmith shops. Saturday afternoon was the big parade. The entire surrounding area showed up to celebrate the happy couple. 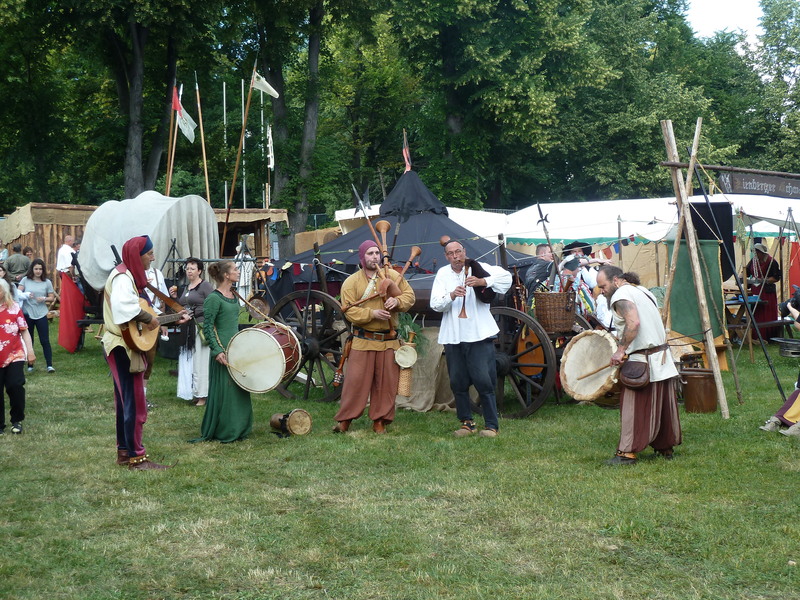 There were jugglers, musicians, dancers, even a group of lively witches. Like any good parade there were people handing out candy, but some people had baskets full of bread to hand out instead. There were also flag throwers from Sachsen-Anhalt and the neighboring province. Other than the parade and shopping, there were plenty of musicians playing in courtyards and on the street, plus various other events, like a fire show. I learned my new favorite German word at the festival: Dudelsack (bagpipes). It is hard to pick what my favorite part of the festival was, because it was all so amazing, but one strong contender is the food. 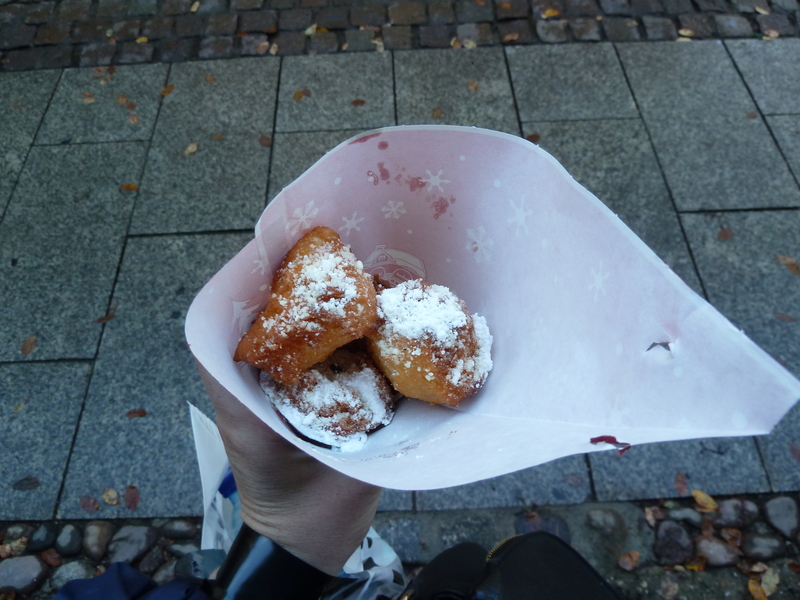 One stand sold Quarkkrapfen, which were basically just globs of fried dough with powdered sugar. Eating that fresh out of the fryer while listening to a medieval choir with a glass of strawberry wine is legitimately my idea of a fantastic Saturday night. 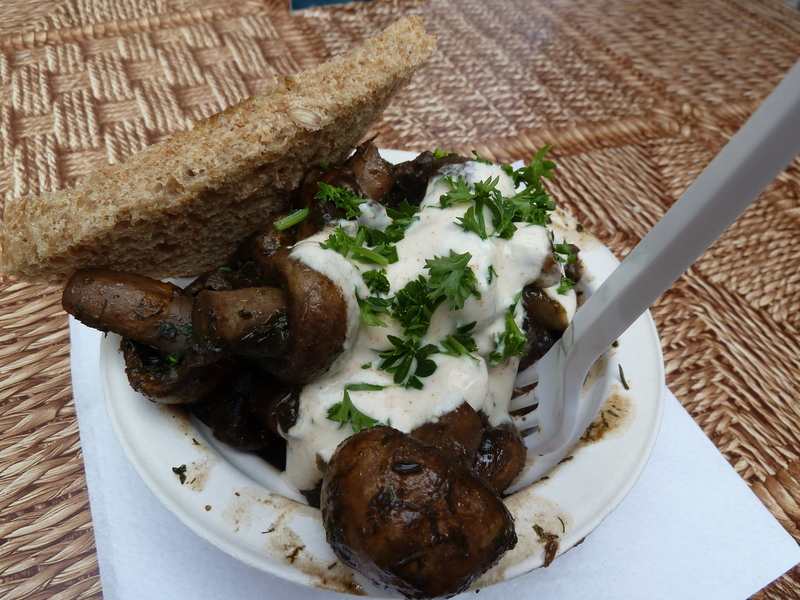 Other gastronomical highlights included Knoblibrot (garlic bread) and Champignons (mushrooms that were roasted in a delicious herb sauce). The three days of the festival were an amazing trip: shopping, eating, and walking through another time. The only American equivalent I can think of are Renaissance fairs, but this was so much better than any Ren Faire I have ever been to. For our last week in Wittenberg we had lots of going away activities. They included a cook out by the River Elbe and an Abschiedsabend (summer party)with everyone’s guest parents. I left Wittenberg happy to be returning home to Dallas, but sad to leave behind my lovely host family and the charming town of which I had become so fond. It almost feels like leaving a dream. A place where summers are mild and I, self-proclaimed city girl and indoor enthusiast, rose early in the morning to ride a bike through the countryside. Walking up from picturesque, German, cobblestone streets to the sleek pavement of suburbia. This was a fantastic trip, and I have learned and experienced so much. After a safe and uneventful trip home I am left to sort through all of the memories I have made. 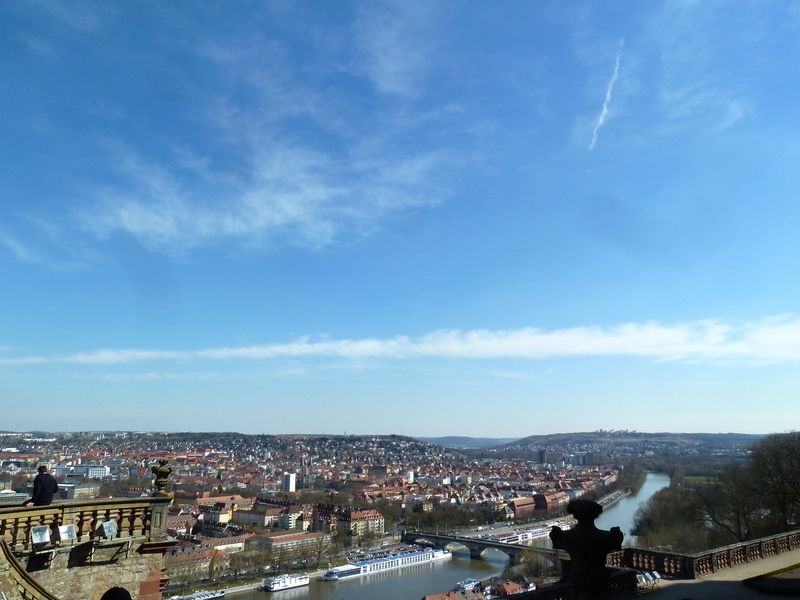 I thought that it was high time that I finally got around to posting about my trip to Dresden two weeks ago. We arrived at the train station in Wittenberg very early on Saturday morning for our three-hour train ride to Dresden. 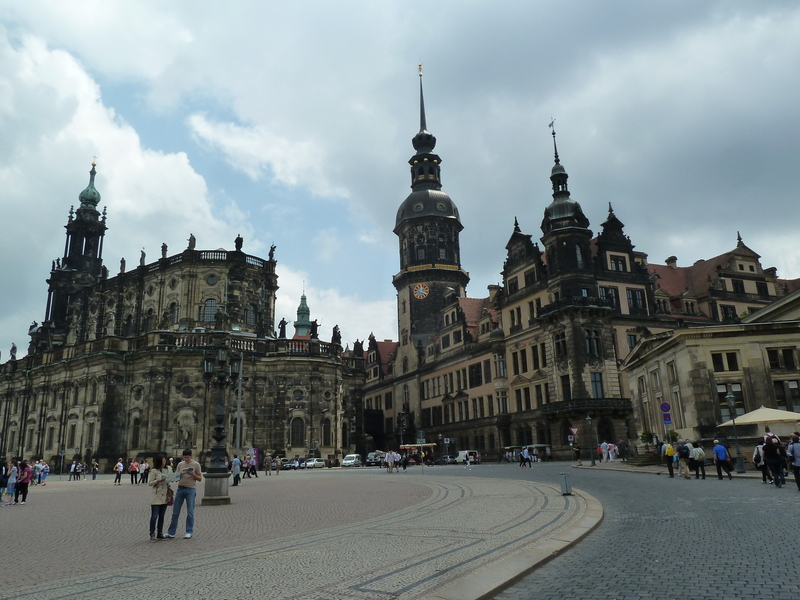 When we arrived in Dresden we immediately set off for a city tour. Our tour guide, Susie, was full of interesting factoids about the many historic places in Dresden. Most of the city was destroyed in the air raids of 1945 and not reconstructed until reunification in 1989. This fact is much more impressive when you break through the long walkway of modern shops and hotels into the old town. It is nothing but beautiful buildings from every angle. 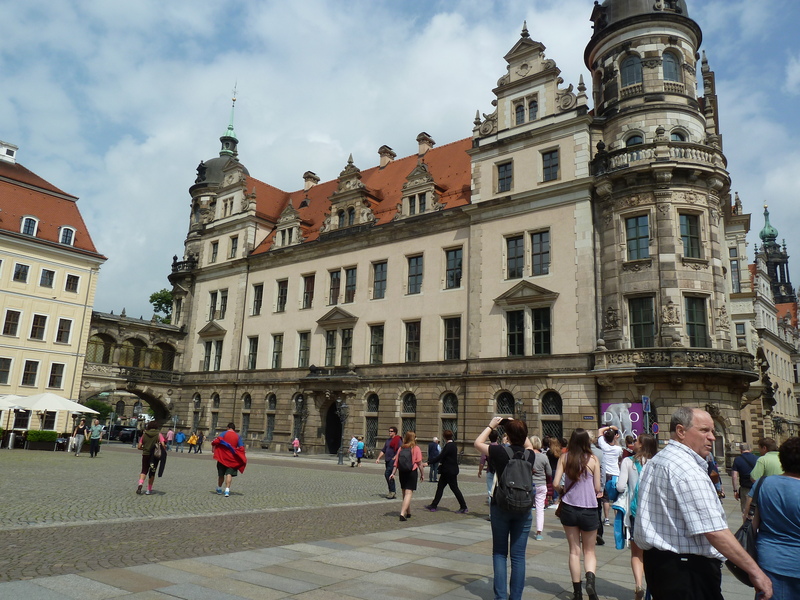 We walked though the Residenzschloss, the royal palace for the Prince Elector of Saxony, and the Zwinger. 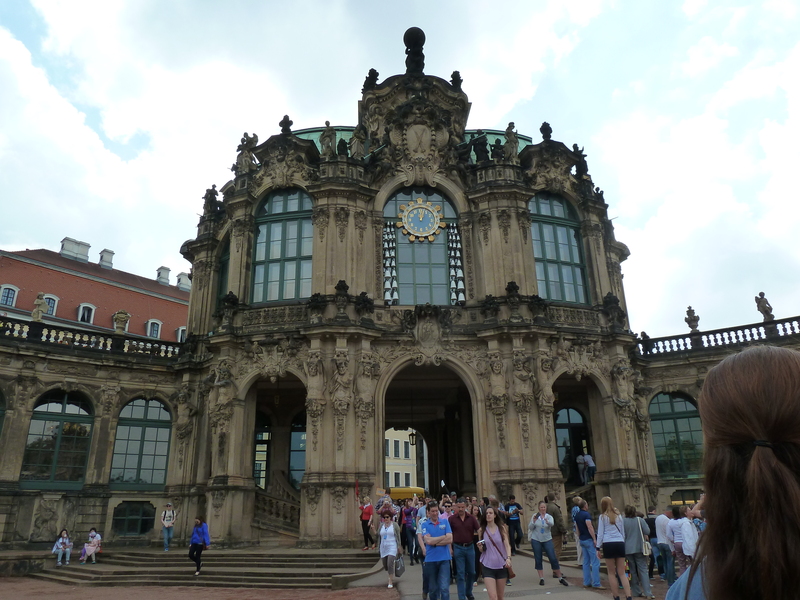 I was fascinated by the Zwinger, which was built by Dresden’s most famous ruler, Augustus the Strong, for his son’s new wife Maria Josepha, the daughter of the Habsburg emperor. Much like the World Cup, the royal family in Dresden received four years notice that the princess from Austria was coming to live there. And, just like the World Cup, this marriage needed a stadium. This stadium was the Zwinger. Literally build as a massive, beautiful façade around a parade ground, it was never meant to serve any purpose other than to be visually stunning. I loved that about it. Over the years it was slated for destruction, but the funds to do so dried up. Later it was reconstructed in the 1930’s. Unfortunately, it was one of the buildings destroyed in 1945. 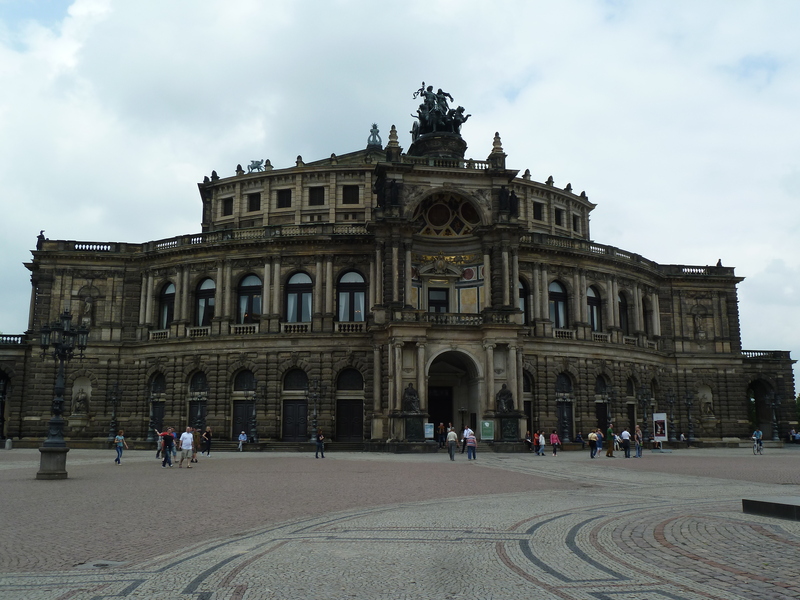 Rebuilt again, it now stands in all of its former glory between the Residenzschloss and the Semperoper. I could go on and on about the cool historical buildings, but that might bore some of y’all. There are so many places to see, including the Catholic Church built just for August the Strong, the Parade of Princes, and the Turkish palace. 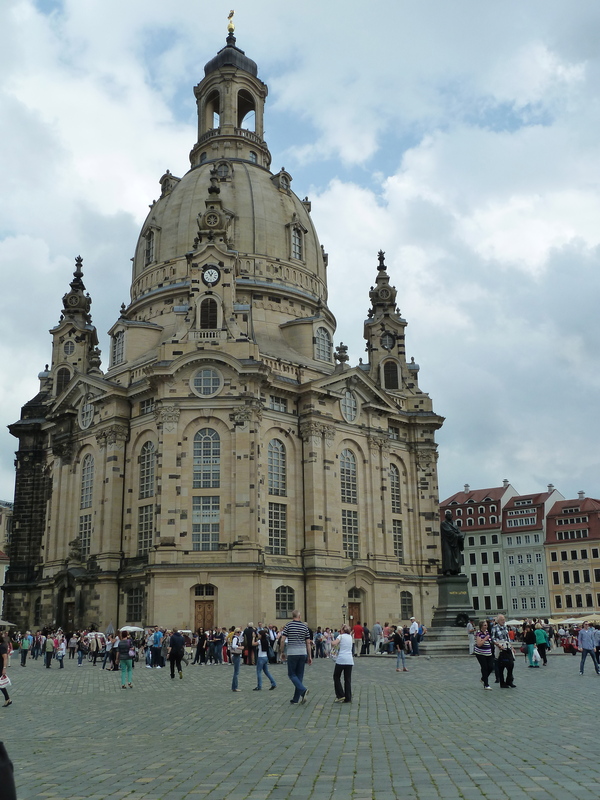 My other favorite building was the Frauenkirche, where we ended our tour. 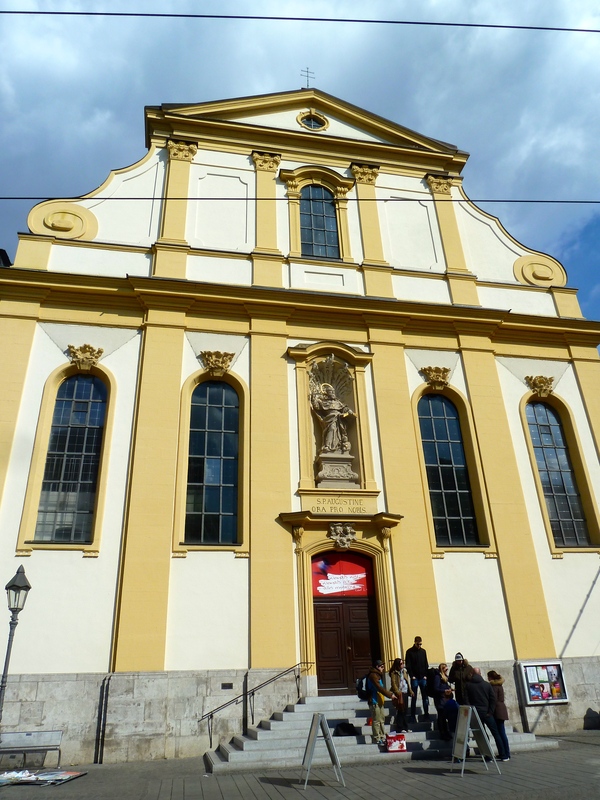 An absolutely stunning Lutheran Church originally built under the reign of Augustus the Strong in the 1700s, the church was built on the land of the earlier Lutheran church, which was much smaller. To accommodate most of the townspeople who would attend services in the small place of the church, the building is almost completely round and several stories tall with a 96 meter high dome. 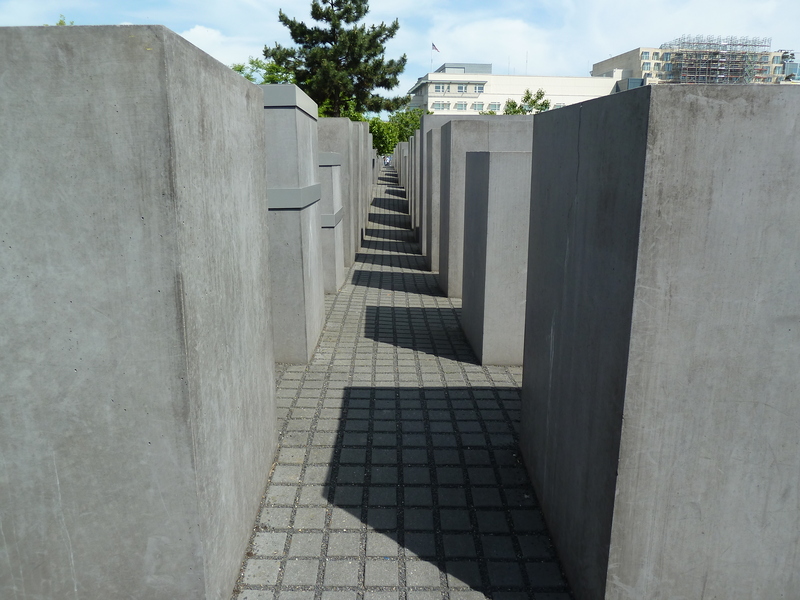 After its destruction in 1945, it was rebuilt in 1989, funded mostly through donations from around the world. 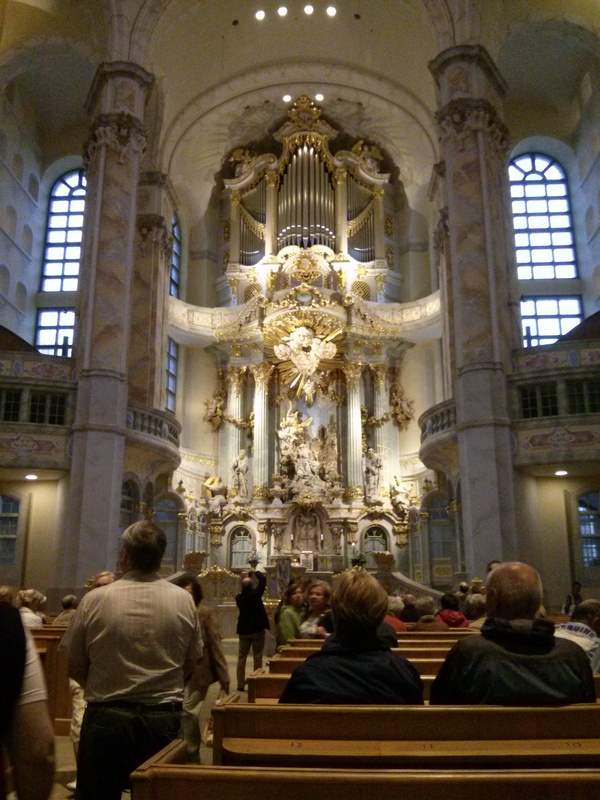 The inside is breathtaking, all blue and gold with a massive organ. When I came back later in the afternoon they were having an organ concert, so I got to hear some of the music. 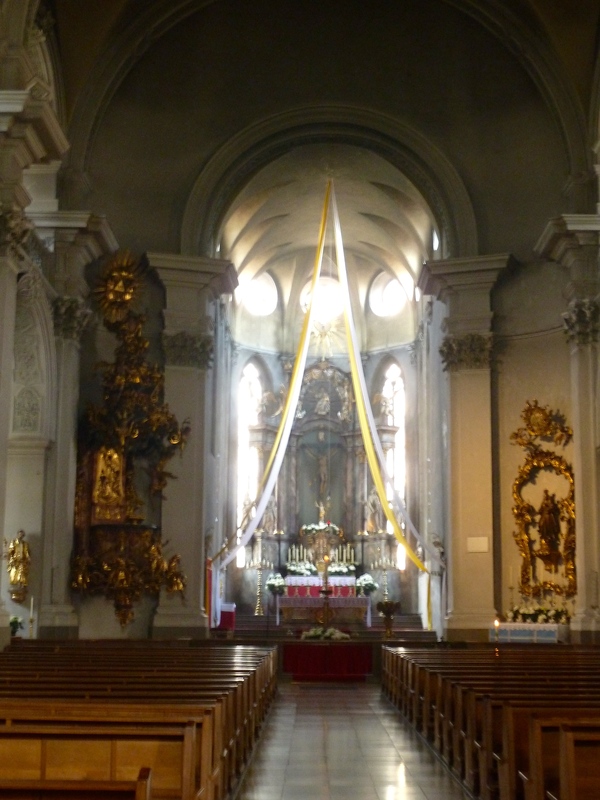 The inside of the Frauenkirche. This picture does not do the beauty justice. 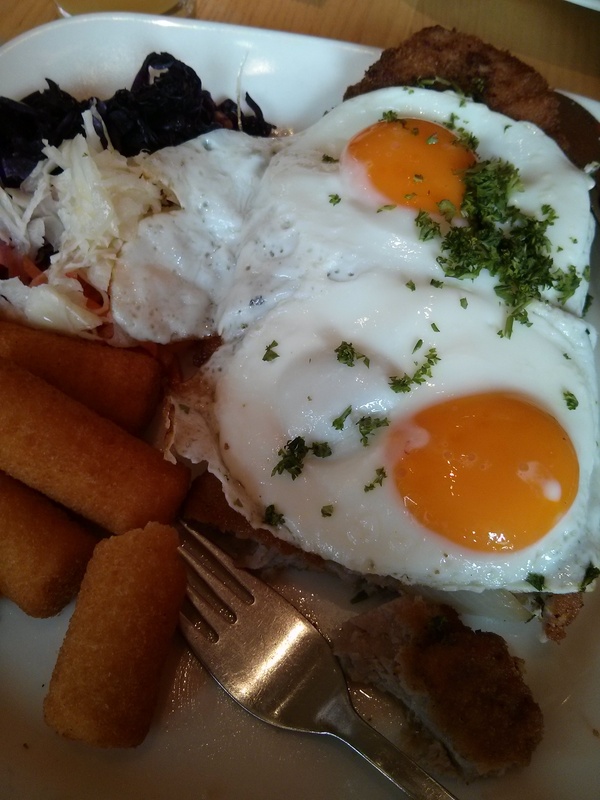 After our tour we ate lunch at Schnitzelgarten, which lived up to its name in delicious schnitzel. 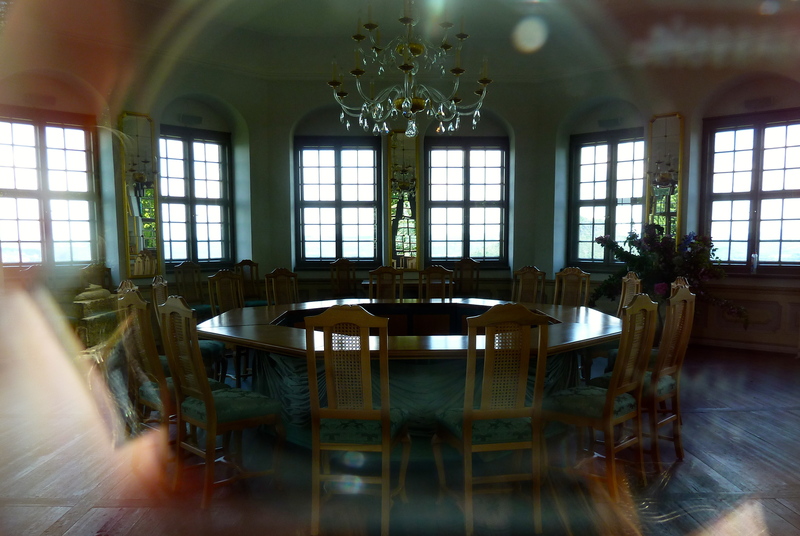 Later we got free time, so I went back to the Residenzschloss to see the museum housed there. While I couldn’t get a ticket for the famous Historic Green Vault, anyone with a regular admission ticket can go to the Neues Günes Gewölbe (New Green Vault). The New Green Vault holds almost exclusively expensive trinkets. Cups made from mother of pearl shells, coral, gold, and porcelain that you could never drink out of, giant sculptures made of ivory, tiny cherry pits with 158 faces carved in them, a huge diagram of a Turkish coronation, the world’s largest green diamond, and much more. It was another fantastic example of things that were beautiful for beauty’s sake. I spent over an hour wandering around in awe, trying to take in all of the things. Photographs were not allowed, but you can get a glimpse here. The museum also housed a portrait collection with a very friendly guard, a collection of Turkish armor and weapons, and a huge exhibit on jousting apparel. I spent a great few hours there. Following a nice dinner outside a café, we wandered around to see the city at night. The views from the River Elbe were pretty spectacular, and we were pleasantly surprised by a fireworks show. 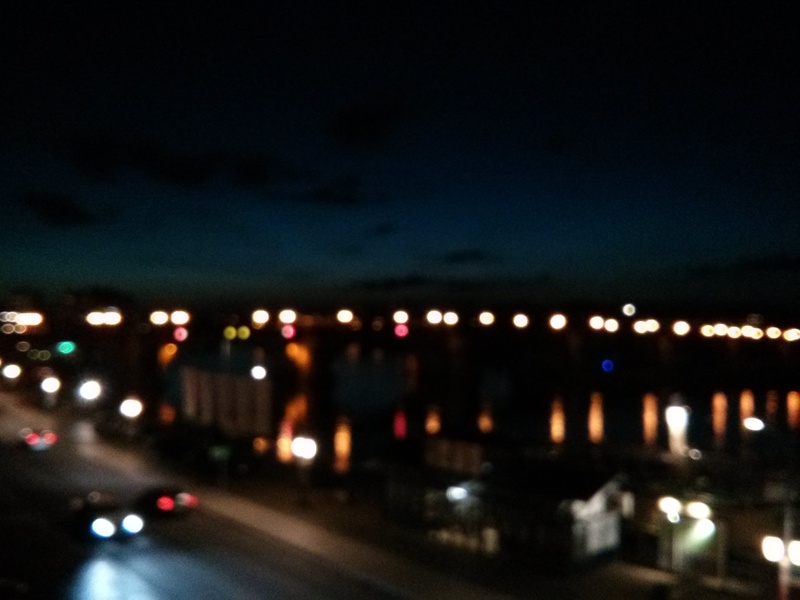 The River Elbe at night. 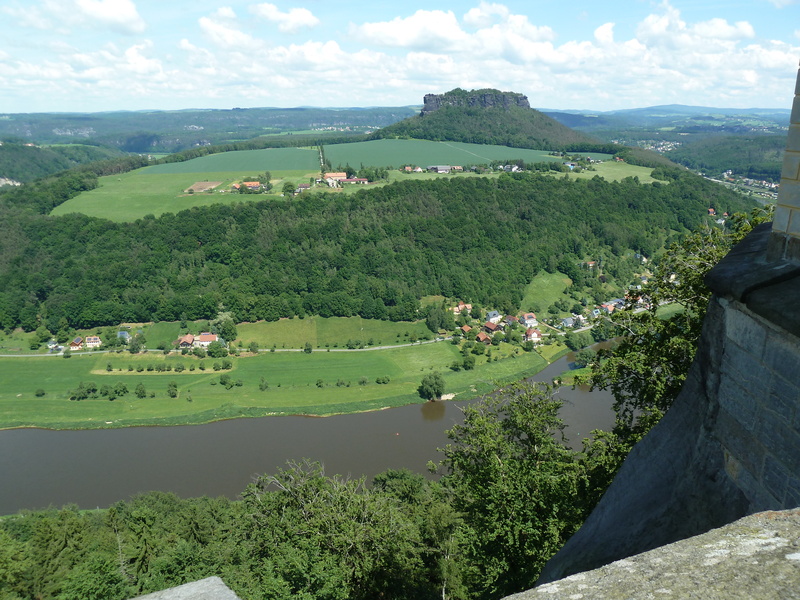 The next day we went on an excursion to Königstein, which is the literal cliff that I am going to leave you hanging on. I promise to post all about the fortress soon, so stay tuned! A sneak peek at Königstein!